Major General Borys D. Tregubov, Assistant to the Head of the State Border Protection Service of Ukraine, as Technical Advisers. 1. 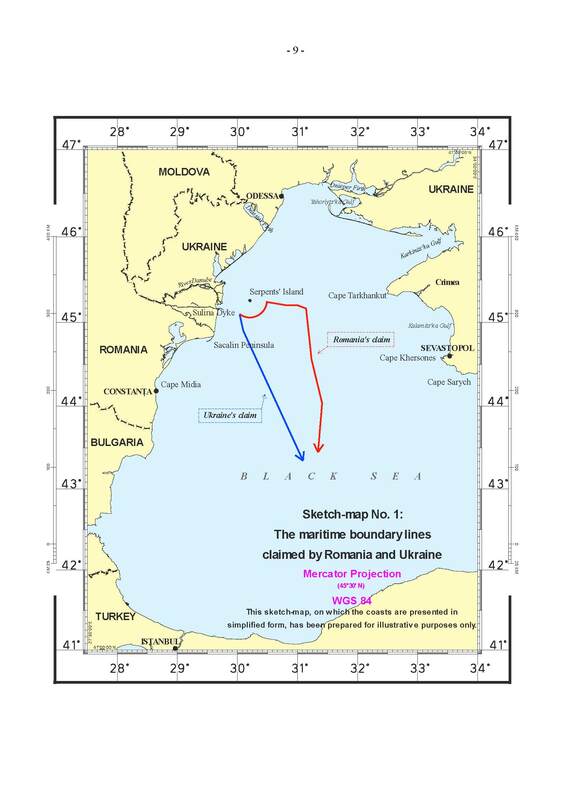 On 16 September 2004 Romania filed in the Registry of the Court an Application dated 13 September 2004, instituting proceedings against Ukraine concerning the delimitation of the continental shelf and the exclusive economic zones of Romania and Ukraine in the Black Sea. between the Ministers for Foreign Affairs of Romania and Ukraine. The Additional Agreement was concluded with reference to Article 2 of the Treaty on the Relations of Good Neighbourliness and Co-operation between Romania and Ukraine, signed on 2 June 1997 (hereinafter the �Treaty on Good Neighbourliness and Co-operation�). Both instruments entered into force on 22 October 1997. 2. Pursuant to Article 40, paragraph 2, of the Statute, the Registrar immediately communicated a certified copy of the Application to the Government of Ukraine; and, in accordance with paragraph 3 of that Article, all States entitled to appear before the Court were notified of the Application. 3. Pursuant to the instructions of the Court under Article 43 of the Rules of Court, the Registrar addressed to States parties to the United Nations Convention on the Law of the Sea of 10 December 1982 the notifications provided for in Article 63, paragraph 1, of the Statute of the Court. In addition, the Registrar addressed to the European Community, which is also party to that Convention, the notification provided for in Article 43, paragraph 2, of the Rules of Court, as adopted on 29 September 2005, and asked that organization whether or not it intended to furnish observations under that provision. In response, the Registrar was informed that the European Community did not intend to submit observations in the case. 4. Since the Court included upon the Bench no judge of the nationality of either of the Parties, each Party proceeded to exercise its right conferred by Article 31, paragraph 3, of the Statute to choose a judge ad hoc to sit in the case. Romania chose Mr. Jean-Pierre Cot and Ukraine Mr. Bernard H. Oxman. 5. By an Order dated 19 November 2004, the Court fixed 19 August 2005 and 19 May 2006, respectively, as the time-limits for the filing of the Memorial of Romania and the Counter-Memorial of Ukraine; those pleadings were duly filed within the time-limits so prescribed. 6. By an Order of 30 June 2006, the Court authorized the submission of a Reply by Romania and a Rejoinder by Ukraine, and fixed 22 December 2006 and 15 June 2007 as the respective time-limits for the filing of those pleadings. The Reply of Romania was filed within the time-limits thus fixed. By an Order of 8 June 2007 the Court, at the request of Ukraine, extended to 6 July 2007 the time-limit for the filing of the Rejoinder. Ukraine duly filed its Rejoinder within the time-limit as thus extended. 7. By letter dated 23 August 2007 and received in the Registry on 30 August 2007, the Agent of Romania informed the Court that his Government wished to produce a new document in accordance with Article 56 of the Rules of Court and provided certain explanations in justification of its request, namely that the document was necessary �in order to make as complete a disclosure as possible, both to the Ukrainian party and to the Court, of material evidence� and that the �lateness of disclosure� was due to the fact that the document had not been �filed together with the main archival sources relevant to this matter�. In response, the Agent of Ukraine informed the Court that his Government did not consent to the production of the new document, on the grounds that Romania had not �acted in compliance with Practice Direction IX, since it did not indicate why it considered it necessary to file this new document now, nor did it provide an explanation why it did not produce this map at an earlier stage in these proceedings�. In view of the absence of consent of Ukraine, on 10 December 2007, the Registrar, on the instructions of the Court, requested that the Government of Romania provide further explanations as to why the new document should be regarded as necessary. Such additional explanations were duly submitted by the Government of Romania on 18 December 2007. On 23 January 2008, the Parties were informed that the Court, after considering the views of the Parties, had decided, pursuant to Article 56, paragraph 2, of the Rules of Court, to authorize the production by the Government of Romania of the new document in question. 8. In accordance with Article 53, paragraph 2, of the Rules of Court, the Court decided, after ascertaining the views of the Parties, that copies of the pleadings and documents annexed would be made available to the public as from the opening of the oral proceedings. accordance with Article 61, paragraph 4, of the Rules of Court. [FN1] See sketch-map No. 1 prepared for illustrative purposes only. (b) from Point 2, the line runs along an azimuth of 156� to Point 3, having the co-ordinates of 43� 20' 37" N; 31� 05' 39" E; and then continues along the same azimuth until it reaches a point where the interests of third States potentially come into play. FN1 See sketch-map No. 1 prepared for illustrative purposes only. 14. The maritime area within which the delimitation in the present case is to be carried out is located in the north-western part of the Black Sea. 15. The Black Sea is an enclosed sea connected with the Mediterranean Sea by the Straits of the Dardanelles, the Sea of Marmara and the Bosphorus. The Black Sea is situated between 40� 56' and 46� 33' N and between 27� 27' and 41� 42' E. The Crimean Peninsula extends southward from Ukraine�s mainland into the Black Sea. The Black Sea has a surface area of some 432,000 sq km and consists of the territorial seas and exclusive economic zones of the coastal States which border it. 16. In the north-western part of the Black Sea, approximately 20 nautical miles to the east of the Danube delta, is situated a natural feature called Serpents� Island. Serpents� Island is above water at high tide, has a surface area of approximately 0.17 sq km and a circumference of approximately 2,000 m.
17. The dispute between Romania and Ukraine concerns the establishment of a single maritime boundary delimiting the continental shelf and exclusive economic zones between the two States in the Black Sea. 18. The two States, when they concluded on 2 June 1997 the Treaty on Good Neighbourliness and Co-operation, agreed also through the Additional Agreement (see paragraph 1 above), that they �shall negotiate an Agreement on the delimitation of the continental shelf and the exclusive economic zones in the Black Sea� (Additional Agreement, para. 4). Negotiations for the conclusion of such Agreement were to start �as soon as possible, during a period of three months from the date of the entering into force of the Treaty on Good Neighbourliness and Co-operation� (Additional Agreement, para. 4 (g)). The Treaty entered into force on 22 October 1997, the negotiations on the delimitation of the continental shelf and exclusive economic zones opened in January 1998, but despite their 24 rounds, the last being held in September 2004, as well as ten rounds at an expert level, no delimitation agreement was reached. 19. Under these circumstances, Romania seised the Court on 16 September 2004 by filing, in the Registry of the Court, its Application instituting proceedings in the present case. Romanian-Ukrainian State Border Régime, Collaboration and Mutual Assistance on Border Matters (hereinafter the �2003 State Border Régime Treaty�) was signed, and it entered into force on 27 May 2004. 22. The Parties are in agreement that all the conditions for the Court�s jurisdiction were satisfied at the time of the filing of the Application and that the Court accordingly has jurisdiction to decide the case. However, they differ as to the exact scope of the jurisdiction conferred upon the Court. 23. The issue of the scope of the Court�s jurisdiction was raised by Ukraine in the course of the written proceedings in response to Romania�s contention that �the initial segment of the boundary separating the Romanian exclusive economic zone and continental shelf from the Ukrainian territorial waters around Serpents� Island� between �Point F� (Romania�s way of referring to the point of intersection of the territorial seas of Romania and Ukraine established by the 2003 State Border Régime Treaty) and �Point X� (the endpoint, according to Romania, of the agreed boundary on the 12-mile arc around Serpents� Island) was established by bilateral agreements. In the view of Romania, �the proper way for the Court to conduct the delimitation� is to confirm the boundary between these two points and then to proceed to the determination of the delimitation line in the other segments where the line has not yet been established by the two States. �for the drawing of a delimitation line as claimed by Romania between the so-called points F and X along a 12-nautical mile segment of arc around Serpent� Island, since that portion of [the] line would delimit Ukraine�s territorial sea and Romania�s alleged areas of continental shelf and EEZ�. �the consequence that the boundaries to be delimited by the Court must be such that, starting from the agreed terminal point of their territorial sea boundary, each Party has some zones of continental shelf and EEZ immediately to the east and south of that agreed terminal point�. Ukraine notes however that in its view �this jurisdictional question does not need to be decided because, from Point F, the line proceeds in a south-easterly direction as a line delimiting areas of continental shelf and the EEZs appertaining to each of the Parties�. 25. Romania argues in response that international courts �do not consider themselves inhibited from establishing maritime boundaries separating, on the one hand, the continental shelf (or the exclusive economic zone) of one party and, on the other hand, other maritime areas (including the territorial sea) of the other party�. In any event, in its view, no practical consequences flow from the Parties� divergent approaches to the Court�s jurisdiction. As there is already a maritime boundary running along the 12-nautical mile line around Serpents� Island up to Point X established by bilateral agreements, even if the Court had no jurisdiction to delimit the continental shelf and exclusive economic zone of one Party from the territorial sea of the other, it would still have to take into account the agreements in force between Romania and Ukraine and the resulting maritime boundary. Thus, Romania concludes that, whether the Court has jurisdiction to perform the delimitation between Points F and X or not, this will have no influence on the drawing of a new delimitation line, which in any event will begin from Point X. 26. The Court observes that Ukraine is not contending that under international law, as a matter of principle, there cannot be a delimitation line separating the territorial sea of one State from the exclusive economic zone and the continental shelf of another State. In fact, such a line was determined by the Court in its latest Judgment on maritime delimitation (see Territorial and Maritime Dispute between Nicaragua and Honduras in the Caribbean Sea, Judgment of 8 October 2007). Ukraine rather relies on the terms of paragraph 4 (h) of the Additional Agreement, which in its view, �suggest[s] that the Parties did not anticipate that the Court would be called upon to delimit an all-purpose maritime boundary along the outer limit of Ukraine�s territorial sea� around Serpents� Island. 27. The wording of paragraph 4 (h) of the Additional Agreement that �the problem of delimitation of the continental shelf and the exclusive economic zones shall be solved by the . . .
International Court of Justice�, is neutral as to whether these zones must be found on both sides of the delimitation line throughout its length. The Court is of the view that it has to interpret the provision of paragraph 4 (h) of the Additional Agreement conferring jurisdiction on the Court in the light of the object and purpose of that Agreement and its context. 28. The Additional Agreement specifies the manner in which effect is to be given to the commitment of both Parties stated in Article 2, paragraph 2, of the Treaty on Good Neighbourliness and Co-operation quoted above. The Parties specified, in particular, in paragraph 1 of the Additional Agreement that a Treaty on the régime of the border between the two States should be concluded �not later than 2 years from the date of the entering into force of the Treaty on Good Neighbourliness and Co-operation�, which took place on 22 October 1997. In paragraph 4 of the same Agreement, the Parties specified that an Agreement on the delimitation of the continental shelf and the exclusive economic zones in the Black Sea should be negotiated by the Parties. The Court considers that the Parties intended that all boundary issues between them, whether on land or at sea, be resolved in a comprehensive way. Under the narrow interpretation of Ukraine, the Court would not �settle the problem of the delimitation� between the two States were it not to find substantively for Ukraine. The Court notes that the State Border Régime Treaty was concluded on 17 June 2003, i.e. within six years from the entry into force of the Treaty on Good Neighbourliness and Co-operation, not two as originally contemplated. The 2003 State Border Régime Treaty, in its Article 1, describes the boundary line between the two Parties not only on land but also the line separating their territorial seas, �up to the point of 45� 05' 21" north latitude and 30� 02' 27" east longitude, which is the meeting point [of Ukraine�s territorial sea around Serpents� Island] with the Romanian State border passing on the outer limit of its territorial sea�. 29. No agreement on the delimitation of the continental shelf and exclusive economic zones in the Black Sea was reached. The Parties contemplated in paragraph 4 (h) of the Additional Agreement that, in such circumstances, either of them could request this Court to decide the issue of the delimitation. The Court�s judgment will thus substitute for the non-existent agreement between the Parties on the delimitation of the continental shelf and the exclusive economic zones and shall resolve all such matters which have not been settled by the Parties. 30. In discharging its task, the Court will duly take into account the agreements in force between the Parties relating to the delimitation of their respective territorial seas. The Court has no jurisdiction to delimit the territorial seas of the Parties. Its jurisdiction covers the delimitation of their continental shelf and the exclusive economic zones. However, contrary to what has been suggested by Ukraine, nothing hinders that jurisdiction from being exercised so that a segment of the line may result in a delimitation between, on the one hand, the exclusive economic zone and the continental shelf of one State, and, on the other hand, the territorial sea of the other State at its seaward limit. 31. Both Romania and Ukraine are parties to the 1982 United Nations Convention on the Law of the Sea (UNCLOS). Romania deposited its instrument of ratification on 17 December 1996 and Ukraine on 26 July 1999. �1. The delimitation of the exclusive economic zone [the continental shelf] between States with opposite or adjacent coasts shall be effected by agreement on the basis of international law, as referred to in Article 38 of the Statute of the International Court of Justice, in order to achieve an equitable solution. 3. Pending agreement as provided for in paragraph 1, the States concerned, in a spirit of understanding and co-operation, shall make every effort to enter into provisional arrangements of a practical nature and, during this transitional period, not to jeopardize or hamper the reaching of the final agreement. Such arrangements shall be without prejudice to the final delimitation. 32. Romania states that the Parties concur in the view that the Procès-Verbaux concluded between Romania and the USSR in 1949, 1963 and 1974 are agreements which are legally binding on the Parties. Romania contends that these agreements, which establish the initial segment of the maritime boundary, should be taken into account as agreements relating to the delimitation within the meaning of Articles 74, paragraph 4, and 83, paragraph 4, of UNCLOS. Another such agreement is the 2003 State Border Régime Treaty which delimited the maritime boundary up to the outer limit of the territorial sea at the point of intersection of Romania�s territorial sea with the 12-nautical mile arc drawn around Serpents� Island. According to Romania, in any event, the question as to whether or not the agreements fall within the above-mentioned category is of no consequence: they are binding on the Parties, and it is for the Court to ensure their application. (e) the principle of taking into consideration the special circumstances of the zone submitted to delimitation�. Romania also affirms that the delimitation should be carried out in accordance with the provisions of UNCLOS. 34. Romania asserts, with regard to the Additional Agreement, that if the Parties had intended to impose limits on the relevance of the �principles and procedures� set out in paragraph 4 therein, that would have been made clear in the Agreement. Romania contends that its position is supported by the terms of Article 2, paragraph 2, of the Treaty on Good Neighbourliness and Co-operation, according to which the parties �shall settle the problem of the delimitation of their continental shelf and of economic exclusive zones in the Black Sea on the basis of the principles and procedures agreed upon by [the 1997] exchange of letters . . .�. Romania asserts with reference to this provision that no distinction is made between, on the one hand, the negotiations and, on the other hand, the other procedures to which the Parties might have recourse to solve the problem of delimitation. Romania contends that, under these circumstances, Ukraine�s acceptance of the reference to Article 121 as one of the principles to be applied in delimitation clearly indicates that the two States agreed in 1997 that Serpents� Island could receive no other effect in addition to those effects already produced by it on the delimitation of the territorial seas of the two Parties. 36. Ukraine contends that the Court is obliged to decide disputes in accordance with international law, as laid down in Article 38, paragraph 1, of the Statute. In relation to maritime delimitation and as between the Parties to the present case, �that applicable body of rules of international law comprises principally the provisions of UNCLOS and certain specific rules which have become well established in the jurisprudence of the Court�. to negotiate a delimitation agreement, but they were not agreed by the Parties as applying to the subsequent judicial proceedings. At the same time Ukraine acknowledges that some of these principles may be relevant as part of the established rules of international law which the Court will apply but not as part of any bilateral agreement. 38. Ukraine further argues that the 1949, 1963 and 1974 Procès-Verbaux and the 1997 Additional Agreement do not constitute agreements mentioned in Articles 74, paragraph 4, and 83, paragraph 4, of UNCLOS because they were not agreements delimiting the continental shelf and exclusive economic zones. 39. With regard to the declaration made by Romania with respect to Article 121 upon the signature and ratification of UNCLOS, Ukraine points out the difference between a declaration and a reservation, and states that a declaration �does not modify the legal effect of the treaty in question� and does not call for any response from the other Contracting Parties. Thus, according to Ukraine, the Court does not have to take into consideration Romania�s declaration. As Ukraine further notes, Romania claims that the reference to Article 121 of UNCLOS in the Additional Agreement of 1997, considered to be one of the principles applicable to the delimitation, demonstrates that Ukraine has thus �accepted the applicability of the third paragraph of Article 121, as interpreted by the Romanian declaration, to the present situation�; for Ukraine, this assertion is groundless. 40. In deciding what will be a single maritime delimitation line, the Court will duly take into account the agreements in force between the Parties. Whether the Procès-Verbaux concluded between Romania and the USSR in 1949, 1963 and 1974 constitute agreements relating to the delimitation within the meaning of Articles 74, paragraph 4, and 83, paragraph 4, of UNCLOS, depends on the conclusion the Court will reach on Romania�s contention that they establish the initial segment of the maritime boundary which the Court has to determine. The Court considers the issue in Section 4 of this Judgment. 41. With respect to the principles listed in subparagraphs 4 (a) to (e) of the Additional Agreement, the Court is of the view that the chapeau of that paragraph providing that �[t]he Government of Ukraine and the Government of Romania shall negotiate an Agreement on the delimitation of the continental shelf and the exclusive economic zones in the Black Sea, on the basis of the following principles and procedures� (emphasis added), suggests that these principles were intended by the Parties to be taken into account in their negotiations on the maritime delimitation, but do not constitute the law to be applied by the Court. This does not necessarily mean that these principles would per se be of no applicability in the present case; they may apply to the extent that they are part of the relevant rules of international law. The Court further notes that the principles listed in the Additional Agreement were drawn up by the Parties in 1997. The entry into force of UNCLOS as between the Parties in 1999 means that the principles of maritime delimitation to be applied by the Court in this case are determined by paragraph 1 of Articles 74 and 83 thereof. 42. Finally, regarding Romania�s declaration, quoted in paragraph 35 above, the Court observes that under Article 310 of UNCLOS, a State is not precluded from making declarations and statements when signing, ratifying or acceding to the Convention, provided these do not purport to exclude or modify the legal effect of the provisions of UNCLOS in their application to the State which has made a declaration or statement. The Court will therefore apply the relevant provisions of UNCLOS as interpreted in its jurisprudence, in accordance with Article 31 of the Vienna Convention on the Law of Treaties of 23 May 1969. Romania�s declaration as such has no bearing on the Court�s interpretation. 43. The Court notes that the Parties disagree as to whether there already exists an agreed maritime boundary around Serpents� Island for all purposes. They therefore disagree also on the starting-point of the delimitation to be effected by the Court. To clarify the issues under discussion, the Court must distinguish between these two different matters: firstly, the determination of the starting-point of the delimitation as a function of the land boundary and territorial sea boundary as already determined by the Parties; and secondly, whether there exists an agreed maritime boundary around Serpents� Island and what is the nature of such a boundary, in particular whether it separates the territorial sea of Ukraine from the continental shelf and the exclusive economic zone of Romania, as claimed by the latter and denied by the former. the Joint Soviet-Romanian Commission for Delimitation of the State Border. Romania states the boundary fixed in 1949 was confirmed in further Soviet-Romanian Procès-Verbaux in 1963 and 1974 and in the 1949 and 1961 Border Treaties between Romania and the USSR. According to Romania, these agreements, �which are binding on Ukraine by way of succession�, established the first part of the maritime boundary along the 12-nautical-mile arc around Serpents� Island. Romania points out that in the 1997 Additional Agreement and the 2003 State Border Régime Treaty, Ukraine expressly affirmed the binding character of the border as agreed in the 1961 Border Régime Treaty between Romania and the USSR which itself affirmed the applicability of the 1949 Procès-Verbaux. 45. According to Romania, it is clear from the language of the 1949 General Procès-Verbal that the Parties agreed that the boundary would follow the exterior margin of the 12-mile marine boundary zone �surrounding� Serpents� Island. Moreover, Romania continues, the Agreement effected an �all-purpose delimitation� which was not limited to an initial short sector in the west. 46. Romania points out that on the sketch-map included in the individual 1949 Procès-Verbal relating to border sign 1439, as well as on map 134 attached to the 1949 General Procès-Verbal, the boundary is clearly drawn along the 12-nautical-mile arc around Serpents� Island until the edge of the said maps. It asserts that the sketch-maps form an integral part of the Procès-Verbaux and have to be given a corresponding weight. In its view, regardless of whether they are to scale or are geographically accurate, the sketch-maps confirm the meaning of the text of the Procès-Verbaux, namely that the State boundary line extends beyond border sign 1439 along the 12-mile arc around Serpents� Island, and that it has the same character along its entire length. 47. Romania adds that, although the final point of the maritime boundary between Romania and the USSR was not identified by specific geographical co-ordinates, the extent of the agreed boundary is fixed by the language of the 1949 General Procès-Verbal itself. The existence and acceptance of the maritime boundary around Serpents� Island following the 12-nautical-mile arc until a point situated due east of the island is also confirmed by various navigation charts issued after 1949 by the USSR and later Ukraine, as well as by Romania, Bulgaria, France and Germany. These charts, Romania maintains, consistently show the boundary as extending beyond the last point depicted on map 134, and as having the same character along its entire length up to a point due east of Serpents� Island. Romania claims that the position of this point, which it refers to as �Point X�, coincides on all of these charts: it is located at approximately 45� 14' 20" N and 30� 29' 12" E.
48. The last point of the boundary depicted on map 134 cannot be considered, in Romania�s view, the final point of the boundary because the short segment of the boundary from border sign 1439 up to the point where the drawing terminates does not constitute a boundary �surrounding� Serpents� Island as envisaged in the text of the individual 1949 Procès-Verbal relating to border sign 1439. Romania further argues that the blank space between the endpoint of the line depicted on map 134 and the edge of the map is of no relevance and cannot serve as an argument that this point is the final point of the boundary. Map 134 was intended to depict the boundary between Points 1438 and 1439, and �the boundary sectors situated both before and beyond point 1438 and 1439 are only partially depicted�. 49. According to Romania, the fact that there happens to be a close coincidence between the endpoint of the boundary on map 134 and the point of intersection of 12-nautical-mile territorial seas of Romania and Ukraine, identified in the 2003 State Border Régime Treaty, does not prove that the endpoint of the boundary on map 134 was a final point of the maritime boundary agreed in 1949. While the endpoint of the boundary on map 134 is at approximately 12 nautical miles from the Sulina dyke as it exists presently, in 1949 (when the dyke was shorter) this point was at about 13.4 nautical miles from the Romanian coast. No conclusion as to what was agreed in 1949 is to be drawn from coincidences resulting from the changing coastal situation. 50. Ukraine disagrees that a maritime boundary along the 12-nautical-mile arc around Serpents� Island up to Point X was established by the agreements between Romania and the USSR starting from 1949. It further argues that both Parties acknowledge that the final point of the State border was established by the 2003 State Border Régime Treaty, which means that maritime spaces beyond this point had not previously been delimited. 51 In particular, Ukraine asserts that the text of the 1949 Procès-Verbaux did not provide for an all-purpose maritime boundary, and neither did map 134. It notes that in accordance with the settlement recorded in the 1949 Procès-Verbaux the boundary line between Points 1437 and 1438 �is a true State boundary between the territorial sea and/or internal waters of Romania and the Soviet Union�. The boundary line running out to sea from Point 1438 in the direction of Point 1439 was �a true State boundary between the territorial seas of Romania and the Soviet Union only as far out as a point 6 nautical miles from the baseline from which Romania�s territorial sea is measured�. The boundary running further out to sea beyond the 6-nautical-mile point to Point 1439 and thereafter following the 12-nautical-mile arc around Serpents� Island was the boundary between the Soviet Union�s sovereign territorial sea and the adjacent high seas. Waters beyond the territorial sea limits were high seas, which in 1949 meant for Romania the waters beyond 6 nautical miles (since 1951, when Romania extended the breadth of its territorial sea, beyond 12 nautical miles), and for the Soviet Union waters beyond 12 nautical miles. 52. Ukraine argues that neither the 1949 Procès-Verbaux nor any other agreed text identifies the status of the waters to the south of the short length of agreed line along the 12-nautical-mile arc around Serpents� Island. The line agreed in 1949 could not have been intended by the Parties as a line separating sea areas subject to distinctive régimes which at that time simply did not exist, i.e., the continental shelf and exclusive economic zone. Thus, Ukraine asserts that, while the 1949 as well as the 1963 and 1974 Procès-Verbaux are binding international agreements, they �are not continental shelf or EEZ delimitation agreements�. 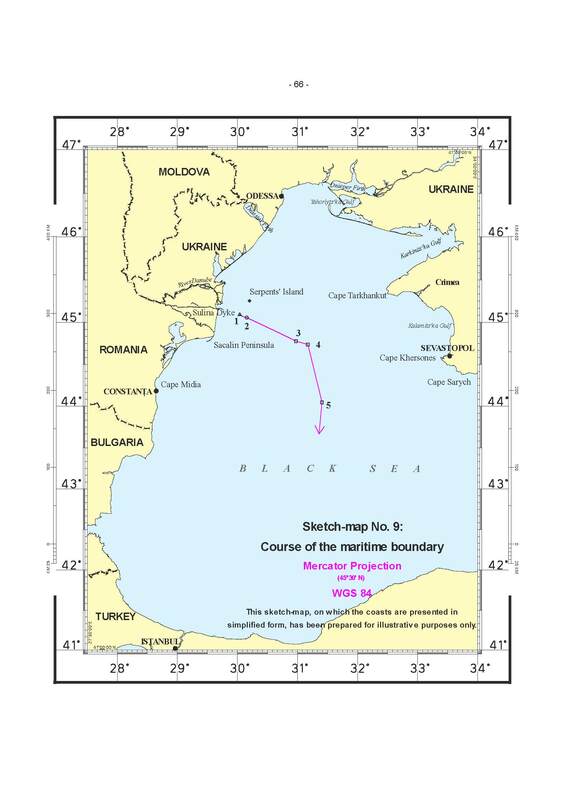 It emphasizes that no relevant text provides for the agreed boundary line to be an �all-purpose� maritime boundary restricting Ukraine�s (and previously the Soviet Union�s) rights �to any and all categories of maritime claims beyond that line�. 53. Ukraine contends that �[n]one of the relevant Procès-Verbaux nor any other agreements say that the agreed boundary extends as far as Romania�s alleged Point X�, nor give any co-ordinates for such a point. This conclusion is evident from a reading of their texts. Ukraine states that map 134 annexed to the 1949 General Procès-Verbal shows that the relevant part of the 12-mile arc around Serpents� Island extends on the arc beyond Point 1439 but without however reaching the edge of the map (there is a blank space). Ukraine maintains that nothing in the text �suggests that the relevant part of the 12-nautical-mile arc around Serpents� Island extended to the south-east or east around Serpents� Island�, as contended by Romania. According to Ukraine, map 134 was intended specifically to show the boundary which had been agreed in the Procès-Verbal to which it was attached, including the endpoint of the boundary. The final point depicted on map 134 is �within a very few metres� of the point agreed in the 2003 State Border Régime Treaty as the point of intersection of the outer limits of Ukraine�s and Romania�s territorial seas (a difference of 93 m (north) and 219 m (east)). 54. As to the cartographic evidence produced by Romania, Ukraine replies that none of the maps or sketch-maps contemporaneous with the 1949 Procès-Verbaux show that the agreed boundary extends as far as Romania�s alleged Point X. Non-contemporaneous maps �are of little or no evidentiary value as to what was agreed in 1949�. In particular, it notes that the maps referred to by Romania are unreliable, cannot serve as a confirmation that there exists an agreed boundary terminating at a point due east of Serpents� Island (Point X) and that none of them �has any substantial legal value�. 55. The Court first notes that the Procès-Verbaux of 1949 resulted from the work of the Joint Soviet-Romanian Border Commission implementing the Protocol to Specify the Line of the State Boundary between the People�s Republic of Romania and the Union of Soviet Socialist Republics, signed in Moscow on 4 February 1948 (hereinafter �the 1948 Protocol�). It emerged from these negotiations that this Protocol was primarily aimed at the modification of what had been agreed upon by the 1947 Paris Peace Treaty between the Allied and Associated Powers and Romania, which confirmed that the Soviet-Romanian border was fixed �in accordance with the Soviet-Romanian Agreement of June 28, 1940, and the Soviet-Czechoslovak Agreement of June 29, 1945�. 57. The Procès-Verbal of the Description of the State Boundary dated 27 September 1949, contains a complete description of the demarcation thus effected in the form of the traversal of the State boundary line from boundary mark No. 1052 to boundary mark No. 1439, covering both the land territory in the national border area and the maritime territory up to Point 1439. It is the description of the border included in this Procès-Verbal, carried forward into later agreements, that is of importance for present purposes. 59. The border lines in the sketch-map included in the individual Procès-Verbal of border Point 1439 (which includes almost the same expression as that just quoted) uses the same symbols from the river mouth (Point 1437) along the line through the coastal waters to Point 1438 and on to Point 1439 and then beyond on the arc around Serpents� Island, shown for about 5 miles, to the point where the arc ends, at the margin of the sketch-map included in that Procès-Verbal. The expressions �CCCP� and �URSS� are used on the Soviet side and �PHP� and �RPR� on the Romanian side, including the short section of the arc. 60. Wording almost identical to that in the 1949 Procès-Verbaux relating to the line beyond Point 1439, set out at the end of paragraph 58 above, was included in a 1954 Act, signed by authorized officers of the two countries, relating to the boundary mark No. 1439. 62. Demarcation negotiations were conducted during the 1970s: in the 1974 general Procès-Verbal, the wording from the general 1963 Procès-Verbal was reprised, while in the 1974 individual Procès-Verbal, the wording reverted to that of the 1949 general Procès-Verbal. The 1974 individual Procès-Verbal included a sketch-map with the same features in terms of the marking of the various sections of the border and the use of the terms �CCCP/URSS� and �PHP/RPR� as were used in the sketch-maps attached to the individual 1949 Procès-Verbal and the individual 1963 Procès-Verbal. �If objective modifications due to natural phenomena which are not related to human activities and that make it necessary for these co-ordinates to be changed are noticed, the Joint Commission shall conclude new protocols. The State border line, on its whole length, shall remain unchanged, unless the Contracting Parties agree otherwise. The definition of the boundary no longer includes the passage about the boundary �passing� or �going on� the exterior margin of the maritime zone �from� Point 1439. Rather the boundary continues from that point �up to� the defined point. 64. In the view of the Court, the argument raised by Romania and based by it on the words �from� and �goes on the exterior margin of the marine boundary zone� cannot support Point X as the endpoint of the agreed boundary (see paragraph 47 above). First, none of the contemporaneous maps and sketch-maps arrive anywhere near Point X. Second, the agreements are about �State borders�, an expression which does not easily apply to areas beyond territory, including territorial seas. Third, while, as Ukraine accepts, the 1949 and later agreements do not specify the endpoint and Point 1439 is not the endpoint, the sketch-map which is part of the Procès-Verbal for Point 1439 does indicate where that endpoint might be; a clearer and more authoritative indication of that point appears, if at a slightly different location, in map 134 which is to scale, unlike the sketch-maps; the map is part of the General Procès-Verbal of 1949 and shows border signs 1438 and 1439 and only a short sector of the arc beyond the latter. Finally, while other features on map 134 go all the way to the margin of the map, the point at which the arc ends is short of the margin of it (it is very close to the point where Romania�s prospective 12-mile territorial sea would intersect with the 12-mile arc around the island). The gap between the end of the arc on that map and the 2003 co-ordinates is about 250 m.
65. A major problem with the Romanian thesis is the lack of any support in the 1948-1949 processes and the resulting agreement for a point to the east of Serpents� Island. Apart from the argument based on the words themselves, the only support for a point to the east of the island to be discerned in the contemporary (1949) documentation is provided by the two sketch-maps and map 134. However, they fall a long way short of Romania�s Point X; further, they produce very different results from each other, from the sketch-map in the Procès-Verbal for Point 1439 and, most importantly, from the end of the arc which appears in the only relevant map in the 1949 Agreement -- map 134. 66. The Court concludes that in 1949 it was agreed that from the point represented by border sign 1439 the boundary between Romania and the USSR would follow the 12-mile arc around Serpents� Island, without any endpoint being specified. Under Article 1 of the 2003 State Border Régime Treaty the endpoint of the State border between the Parties was fixed at the point of intersection where the territorial sea boundary of Romania meets that of Ukraine. The Court will hereinafter refer to this point as �Point 1�. 67. The Court now turns to the question as to whether there exists an agreed line which divides the territorial sea of Ukraine and the continental shelf and the exclusive economic zone of Romania, as contended by the latter. 68. A preliminary issue concerns the burden of proof. As the Court has said on a number of occasions, the party asserting a fact as a basis of its claim must establish it (Sovereignty over Pedra Branca/Pulau Batu Puteh, Middle Rocks and South Ledge (Malaysia/Singapore), Judgment of 23 May 2008, para. 45; Application of the Convention on the Prevention and Punishment of the Crime of Genocide (Bosnia and Herzegovina v. Serbia and Montenegro), Judgment of 26 February 2007, para. 204, citing Military and Paramilitary Activities in and against Nicaragua (Nicaragua v. United States of America), Jurisdiction and Admissibility, Judgment, I.C.J. Reports 1984, p. 437, para. 101). Ukraine placed particular emphasis on the Court�s dictum in the case concerning Territorial and Maritime Dispute between Nicaragua and Honduras in the Caribbean sea (Nicaragua v. Honduras) that �[t]he establishment of a permanent maritime boundary is a matter of grave importance and agreement is not easily to be presumed� (Judgment of 8 October 2007, para. 253). That dictum, however, is not directly relevant since in that case no written agreement existed and therefore any implicit agreement had to be established as a matter of fact, with the burden of proof lying with the State claiming such an agreement to exist. In the present case, by contrast, the Court has before it the 1949 Agreement and the subsequent agreements. Rather than having to make findings of fact, with one or other party bearing the burden of proof as regards claimed facts, the Court�s task is to interpret those agreements. In carrying out that task, the Court must first focus its attention on the terms of those documents including the associated sketch-maps. 69. The Court notes that Articles 74, paragraph 4, and 83, paragraph 4, of UNCLOS are relevant to Romania�s contention that a boundary delimiting the exclusive economic zones and continental shelf beyond Point 1, and extending around Serpents� Island, was established by the 1949 instruments. Paragraph 4 of Articles 74 and 83 provides that where there is an agreement in force between the States concerned, questions relating to the delimitation of the exclusive economic zone and the continental shelf �shall be determined in accordance with the provisions of that agreement�. The word �agreement� in paragraph 4 (as elsewhere in the Article) refers to an agreement delimiting the exclusive economic zone (Article 74) or the continental shelf (Article 83) referred to in paragraph 1. State practice indicates that the use of a boundary agreed for the delimitation of one maritime zone to delimit another zone is effected by a new agreement. This typically occurs when States agree to apply their continental shelf boundary to the exclusive economic zone. The agreement between Turkey and the USSR applying the continental shelf boundary to the exclusive economic zone is one such example. By the same token, if States intend that their territorial sea boundary limit agreed earlier should later serve also as the delimitation of the continental shelf and/or the exclusive economic zones, they would be expected to conclude a new agreement for this purpose. 70. The 1949 instruments make no reference to the exclusive economic zone or the continental shelf. Although in 1949 the Truman Proclamation and the claims that it had begun to stimulate were widely known, neither Party claimed a continental shelf in 1949 nor is there any indication in the case file that either was preparing to do so. The International Law Commission (ILC) had yet to begin its work on the law of the sea which ultimately led to the 1958 Convention on the Continental Shelf and widespread acceptance of that concept. The concept of an exclusive economic zone in international law was still some long years away. The only agreement between the Parties expressly dealing with delimitation of the exclusive economic zone and the continental shelf is the 1997 Additional Agreement. It does not establish a boundary but rather a process for arriving at one, which is reaching its culmination in these proceedings. The detailed provisions regarding factors to be taken into account during the negotiations make no reference to an existing agreement. There was no agreement in 1949 delimiting the exclusive economic zone or the continental shelf within the meaning of Articles 74 and 83 of UNCLOS. 71. A further issue that may arise under international law and Article 311, paragraph 2, of UNCLOS is whether the USSR could have renounced in 1949 any rights which it might then or later have had over waters beyond the territorial sea. There is no express language of renunciation in the 1949 Treaty on the part of the USSR apart from its agreement to a State frontier with Romania. The express mention of a State frontier alludes to sovereignty which includes the territorial sea. The question is whether there is an implied prospective renunciation by the USSR, in a geographical sense with respect to the area beyond 12 miles, and in a legal sense with respect to zones not of sovereignty but of functional competence beyond the territorial sea. 72. Romania proffers a variety of maps by Soviet, Ukrainian and other sources, mostly prepared long after the conclusion of the 1949 instruments. They show hooks or loops around Serpents� Island with varying lengths and markings, all extending beyond the point where the 12-mile territorial seas of the Parties meet. Since in the circumstances there is no question of these maps themselves evidencing a new agreement or an estoppel, the issue is whether any of them evince a correct understanding of the meaning of the 1949 Treaty. 73. The USSR acquired Serpents� Island in the context of the overall territorial settlement that emerged following the Second World War. A primary USSR objective was to consolidate and stabilize the territorial settlement by treaty with Romania, including the USSR�s acquisition of Serpents� Island. 74. So far as the territorial sea is concerned, the Court notes that a 12-mile zone around Serpents� Island would have been consistent with the 12-mile zone that the USSR was claiming generally for its territorial sea. 75. This understanding of the effect of the textual references to the arc in the 1949 instruments is set forth in Article 1 of the 2003 State Border Régime Treaty. That Treaty expressly contemplates the possibility of future agreed modifications of the co-ordinates of the territorial sea boundary due to natural phenomena which are not related to human activities, and provides that �[t]he territorial seas of the Contracting Parties measured from the baselines shall permanently have, at the meeting point of their outer limits, the width of 12 maritime miles�. Thus, the 12-mile arc around Serpents� Island will never be penetrated by Romania�s territorial sea, no matter what changes occur in its coastline or baselines. The Court observes further that the 12-mile arc around Serpents� Island is shown on a map dealing with the State border; this suggests that that arc represents simply the seaward limit of the territorial sea. Recognition by the USSR in the 1949 instruments that its State border followed the outer limit of its territorial sea around Serpents� Island does not signify that it thereby gave up any entitlements to maritime areas beyond that zone. territorial sea with respect to any other maritime zones. Consequently, there is no agreement in force between Romania and Ukraine delimiting between them the exclusive economic zone and the continental shelf. 77. The title of a State to the continental shelf and to the exclusive economic zone is based on the principle that the land dominates the sea through the projection of the coasts or the coastal fronts. As the Court stated in the North Sea Continental Shelf (Federal Republic of Germany/Denmark; Federal Republic of Germany/Netherlands) cases, �the land is the legal source of the power which a State may exercise over territorial extensions to seaward� (Judgment, I.C.J. Reports 1969, p. 51, para. 96). In the Continental Shelf (Tunisia/Libya Arab Jamahiriya) case, the Court observed that �the coast of the territory of the State is the decisive factor for title to submarine areas adjacent to it� (Judgment, I.C.J. Reports 1982, p. 61, para. 73). It is therefore important to determine the coasts of Romania and of Ukraine which generate the rights of these countries to the continental shelf and the exclusive economic zone, namely, those coasts the projections of which overlap, because the task of delimitation consists in resolving the overlapping claims by drawing a line of separation of the maritime areas concerned. 78. The role of relevant coasts can have two different though closely related legal aspects in relation to the delimitation of the continental shelf and the exclusive economic zone. First, it is necessary to identify the relevant coasts in order to determine what constitutes in the specific context of a case the overlapping claims to these zones. Second, the relevant coasts need to be ascertained in order to check, in the third and final stage of the delimitation process, whether any disproportionality exists in the ratios of the coastal length of each State and the maritime areas falling either side of the delimitation line. 79. The Court will begin by briefly setting out the Parties� positions as to their respective relevant coasts (see sketch-maps Nos. 2 and 3). 80. Romania invokes the principle that the relevant coast is the coast that generates the entitlement to maritime zones: that is, the coast whose projection extends over the area in question, which is the area of overlap between the zones generated by the coasts of the two States, so as to give the coastal State the basis for its claim to the area in question. It explains that �the criterion for determining the relevance of any given coast is the actual relation of adjacency or oppositeness between the coasts of the parties, as well as the ability of those coasts to generate overlapping entitlements�. 81. Romania contends that its coast is composed of two distinct segments: a short and more or less straight coast from the last point of the river border with Ukraine to the southern extremity of the Sacalin Peninsula, and a longer slightly concave coast from the extremity of the Sacalin Peninsula to the border with Bulgaria. Romania states that the only major features in this stretch of coast are the Sulina dyke and the mouth of the St. George arm of the Danube, located slightly to the north of the Sacalin Peninsula. The Sacalin Peninsula, which forms a narrow promontory, is the southern limit of this section. From that peninsula, �the coast proceeds in a westerly direction until it reaches the Razim Lake, a brackish Romanian lake separated from the sea by a narrow strip of land�. The coast then gradually curves to the south, and proceeds in a broadly southerly direction until it reaches the land border with Bulgaria, south of Vama Veche. 82. In Romania�s view, the whole Romanian coast is relevant. In particular, the coastal segment situated between the last point of the land/river border between Romania and Ukraine and the outer extremity of the Sacalin Peninsula is relevant for both sectors of the delimitation area characterized respectively by situations of coastal adjacency and coastal oppositeness. The segment situated south of the Sacalin Peninsula to the last point of the Romanian/Bulgarian land border is relevant only for the sector of the delimitation area characterized by a coastal situation of oppositeness. 83. The total length of its relevant coast, according to Romania, is 269.67 km (baselines 204.90 km). 84. Ukraine notes that Romania divides its coast into two segments: first of all, from the land boundary with Ukraine down to the Sacalin Peninsula, and secondly, from that peninsula southwards to the boundary with Bulgaria. 85. Ukraine further contends that �in constructing its claim line, Romania has double counted a significant part of its coast represented by the northern sector of that coast�. According to Ukraine, Romania treats the northern sector of its coast as the relevant �adjacent coast� and then uses its entire coast (i.e., including the northern sector) as the relevant coast for the purposes of delimitation between the �opposite coasts� -- �in other words, it double counts the 70 km long stretch of its northern coast� as relevant for both the �adjacent� maritime boundary and the �opposite� boundary. In response, Romania explains that, while its coast has a role to play both in relation to adjacent coasts and to opposite coasts, in the calculation of the total length of its relevant coast, each of the segments of its coast is counted only once. 86. While Ukraine expresses the view that �significant portions of Romania�s coast actually face south or south-east�, it states that it is nonetheless prepared to treat all of Romania�s coast as a �relevant coast� for purposes of the present delimitation because the �projections from each Party�s coast generate overlapping maritime entitlements and EEZ entitlements in this part of the Black Sea�. 87. The total length of Romania�s coast, according to Ukraine, is approximately 258 km taking into account the sinuosities along that coast. If the coast is measured more generally according to its coastal front, then the length is 185 km. If Romania�s coast is measured by reference to Romania�s system of straight baselines, its length would be approximately 204 km. 88. The Court notes that the Parties are in agreement that the whole Romanian coast constitutes the relevant coast for the purposes of delimitation. The first segment of the Romanian coast, from the last point of the river boundary with Ukraine to the Sacalin Peninsula, has a dual characteristic in relation to Ukraine�s coast; it is an adjacent coast with regard to the Ukrainian coast lying to the north, and it is an opposite coast to the coast of the Crimean Peninsula. The whole coast of Romania abuts the area to be delimited. Taking the general direction of its coast the length of the relevant coast of Romania is approximately 248 km (see sketch-map No. 4). 89. The Court now turns to the issue of the Ukrainian relevant coast for the purpose of this delimitation. The Parties take different views on it. 90. Romania asserts that the Ukrainian coast is characterized by a number of deep indentations and reverses its course sharply several times, with segments facing one another. From the land/river border with Romania, the Ukrainian coast proceeds broadly northwards for a short distance and then in a north-easterly direction until the Nistru/Dniester Firth. The point where its southern bank meets the coast (referred to by Romania as �Point S�), according to Romania, marks the end of that part of Ukraine�s coast which has a relation of adjacency with the Romanian coast. From this point, the Ukrainian coast changes direction proceeding in a north-north-easterly direction until it reaches Odessa. At Odessa it initially goes north and then turns eastwards until the coast reaches the Dnieper Firth. From here the general direction of the coast is first a southerly one, and then, from the bottom of the Yahorlyts�ka Gulf, the direction is an easterly one, until it comes to the bottom of the Karkinits�ka Gulf. The coast then turns back on itself sharply, extending south-westwards along the southern coast of the Karkinits�ka Gulf, until it reaches Cape Tarkhankut. The last sector comprises the coast of Crimea between Cape Tarkhankut and Cape Sarych, which is concave, its general direction being interrupted by a significant protrusion, the western-most point of which is Cape Khersones. According to Romania, the Ukrainian coast is composed of eight distinct segments, determined by marked changes in the direction of the coast. 91. Romania argues that the segments of the Ukrainian coast situated to the north of the line running from Point S to Cape Tarkhankut do not project on the area of delimitation or �have a relationship of either adjacency or oppositeness with the Romanian coast� and therefore are irrelevant for the delimitation. In particular Romania maintains that the coastline of the Karkinits�ka Gulf, immediately north of the Crimean peninsula, should not be counted as a relevant coast, nor �can a closing line drawn across or anywhere within the Karkinits�ka Gulf be treated as a surrogate for its irrelevant coast�. Romania adds that such projections as are made by this northern coast are in fact overtaken by the westward projections of the Ukrainian coast from Cape Tarkhankut to Cape Sarych. 92. Romania states that �Serpents� Island does not form part of the coastal configuration of the Parties; it constitutes merely a small maritime feature situated at a considerable distance out to sea from the coasts of the Parties�. 93. Thus, in Romania�s view, the relevant Ukrainian coast runs between the last point of the land/river border between Romania and Ukraine and Point S, and on the western-facing coast of the Crimean peninsula it runs between Cape Tarkhankut and Cape Sarych. The total length of the relevant Ukrainian coast, as perceived by Romania, is 388.14 km (baselines 292.63 km). 94. Ukraine contends that its own relevant coast is comprised of three distinct sectors each of which generates an entitlement to a continental shelf and an exclusive economic zone in the area subject to delimitation. The first sector extends from the border with Romania until a point located just north of Odessa. In the second sector, north of Odessa, the Ukrainian coast turns to the east and comprises the south-facing littoral along the north-western part of the Black Sea. The coast then extends into the Karkinits�ka Gulf. The third sector comprises the western coast of the Crimean Peninsula from the easternmost point of the Karkinits�ka Gulf to Cape Sarych. (Both Parties agree that Ukraine�s coast east of Cape Sarych is not relevant to the present dispute.) This portion of Ukraine�s coast is characterized by the indentation created by the Karkinits�ka Gulf and by the less pronounced Gulf of Kalamits�ka. All three sectors of Ukraine�s coast generate 200-nautical-mile entitlements which extend over the entire area to be delimited with Romania. delimitation with Romania. Thus Ukraine contends that its coast from Point S to Cape Tarkhankut is relevant for the purposes of the delimitation between the Parties. 96. Ukraine claims that Serpents� Island �forms part of the geographical context and its coast constitutes part of Ukraine�s relevant coasts�. 97. Ukraine concludes that the total length of its relevant coast is 1,058 km (coastal façade 684 km; baselines 664 km). 98. The Court notes that both Parties consider the coast of the Crimean Peninsula between Cape Tarkhankut and Cape Sarych, as well as the Ukrainian coast from their common territorial boundary running for a short distance in a north and subsequently in a north-easterly direction until the Nistru/Dniester Firth (Romania designates this point as Point S) as the relevant Ukrainian coast. Their disagreement concerns the coast extending from this point until Cape Tarkhankut. 99. The Court, in considering the issue in dispute, would recall two principles underpinning its jurisprudence on this issue: first, that the �land dominates the sea� in such a way that coastal projections in the seaward direction generate maritime claims (North Sea Continental Shelf (Federal Republic of Germany/Denmark; Federal Republic of Germany/Netherlands), Judgment, I.C.J. Reports 1969, p. 51, para. 96); second, that the coast, in order to be considered as relevant for the purpose of the delimitation, must generate projections which overlap with projections from the coast of the other party. Consequently �the submarine extension of any part of the coast of one Party which, because of its geographic situation, cannot overlap with the extension of the coast of the other, is to be excluded from further consideration by the Court� (Continental Shelf (Tunisia/Libyan Arab Jamahiriya), Judgment, I.C.J. Reports 1982, p. 61, para. 75). 100. The Court therefore cannot accept Ukraine�s contention that the coasts of Karkinits�ka Gulf form part of the relevant coast. The coasts of this gulf face each other and their submarine extension cannot overlap with the extensions of Romania�s coast. The coasts of Karkinits�ka Gulf do not project in the area to be delimited. Therefore, these coasts are excluded from further consideration by the Court. The coastline of Yahorlyts�ka Gulf and Dnieper Firth is to be excluded for the same reason. It is to be noted that the Court has drawn a line at the entrance of Karkinits�ka Gulf from Cape Priboiny (which is the north-western tip of Tarkhankuts�ky Peninsula, slightly north of Cape Tarkhankut) to the point that marks the eastern end of the portion of the Ukrainian northern coast that faces the area to be delimited. This point (whose co-ordinates are approximately 46� 04' 38'' N and 32� 28' 48'' E) lies at the intersection of the meridian passing through Cape Priboiny with the northern coast of Karkinits�ka Gulf, east of Zaliznyy Port. 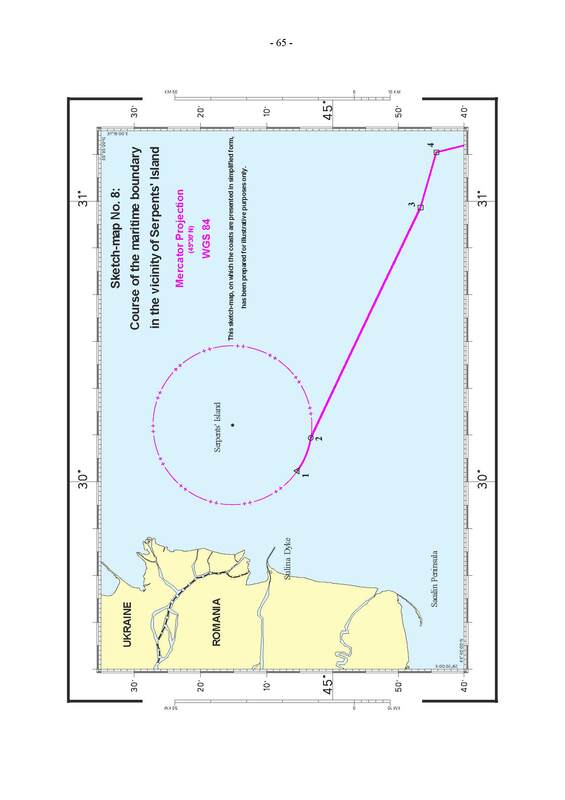 The Court has found it useful to do so with respect to such a significant feature as Karkinits�ka Gulf, in order to make clear both what coasts will not be under consideration and what waters will not be regarded as falling within the relevant area. However, the Court does not include this line in the calculation of the total length of the Ukrainian relevant coasts, as the line �replaces� the coasts of Karkinits�ka Gulf which, again, do not themselves project on the area to be delimited and thus do not generate any entitlement to the continental shelf and the exclusive economic zone in that area. Consequently, the line does not generate any entitlement. 101. As for the remaining sectors of the Ukrainian coast between Point S and Cape Tarkhankut, the Court observes that the north-western part of the Black Sea (where the delimitation is to be carried out) in its widest part measures slightly more than 200 nautical miles and its extent from north to south does not exceed 200 nautical miles. As a result of this geographical configuration, Ukraine�s south-facing coast generates projections which overlap with the maritime projections of the Romanian coast. Therefore, the Court considers these sectors of Ukraine�s coast as relevant coasts (see sketch-map No. 4). 102. The coast of Serpents� Island is so short that it makes no real difference to the overall length of the relevant coasts of the Parties. The Court will later examine whether Serpents� Island is of relevance for the choice of base points (see paragraph 149 below). 103. The length of the relevant coast of Ukraine is approximately 705 km. 104. 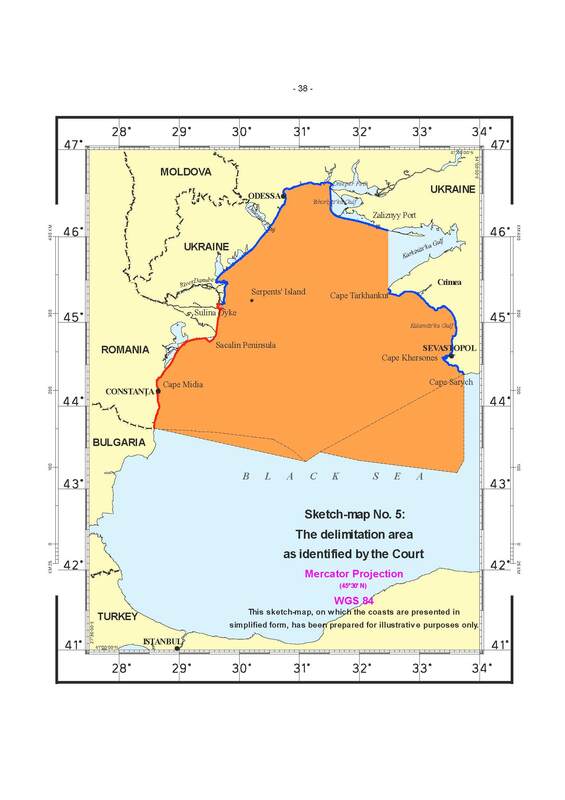 The Court notes that on the basis of its determination of what constitutes the relevant coasts, the ratio for the coastal lengths between Romania and Ukraine is approximately 1:2.8. 105. The second aspect mentioned by the Court in terms of the role of relevant coasts in the context of the third stage of the delimitation process (see paragraph 78 above) will be dealt with below in Section 11. 106. Romania maintains that the relevant area in the north is bordered by the line running from Point S to Cape Tarkhankut. In the south, the area is bordered by the line equidistant between the adjacent Romanian and Bulgarian coasts, the median line between the opposite Romanian and Turkish coasts and the delimitation line agreed upon by the USSR and Turkey, to which agreement Ukraine has succeeded. In the south-east the area is bordered by the meridian uniting Cape Sarych with the delimitation boundary between Ukraine and Turkey. In the west and in the east the limits of the area are formed by the Romanian and Ukrainian relevant coasts. 107. According to Romania, the relevant area means all of the waters generated by projections from the relevant coasts, whether or not claimed by the other State. Romania states that there are three points of disagreement between the Parties as to the relevant area. 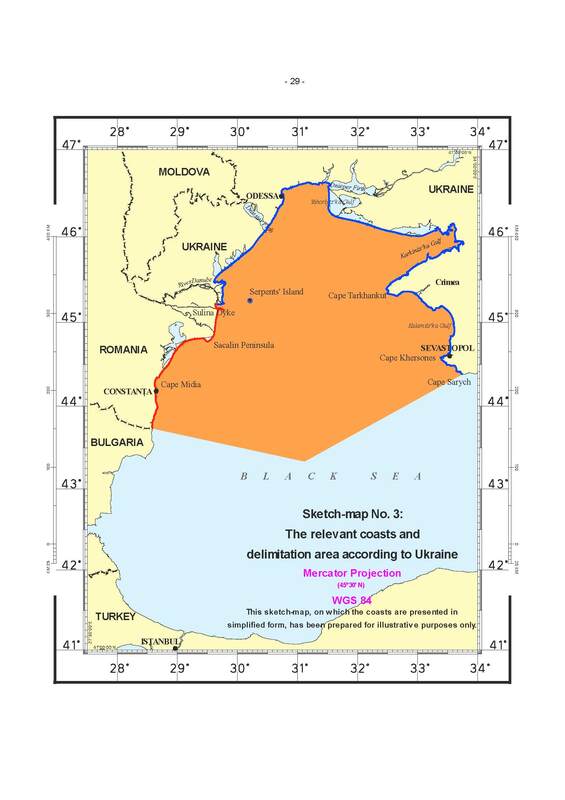 First, Romania asserts that the coasts looking on to the area north of the line between Point S and Cape Tarkhankut are all Ukrainian, and that none of them are relevant to the delimitation. Second, it states that the south-western limit is represented by the equidistance line between the adjacent Romanian and Bulgarian coasts and that to move the line south of this equidistance line could prejudge potential interests of Bulgaria in this maritime area. Third, Romania claims that the south-eastern triangle lying between Ukraine and Turkey also forms part of the relevant area because it is within a 200-mile projection from the Romanian coasts (see sketch-map No. 2). 108. Ukraine contends that the western limit of the relevant area corresponds to the Romanian coastline between the land boundaries with Bulgaria and Ukraine and the stretch of the Ukrainian coast extending from the border with Romania until a point located just north of Odessa. In the north, the relevant area is bordered by the south-facing Ukrainian coast. In the east, the relevant area is bordered by the west-facing coast of the Crimean Peninsula terminating at Cape Sarych. The southern limit of the relevant area is a line drawn perpendicular from the mainland coast from the point where the Bulgarian/Romanian land border reaches the Black Sea until a point between the Romanian and Ukrainian coasts where the interests of third States potentially come into play. This point is then connected to Cape Sarych by a straight line which represents the south-eastern limit of the relevant area. 109. Ukraine contends, as to the three points of disagreement, that all of its south-facing coast between Point S and Cape Tarkhankut generates maritime entitlements to a distance of 200 nautical miles and that this maritime area, accordingly, forms part of the relevant area. Ukraine further argues that the relevant area should include a sliver of maritime area situated between the hypothetical equidistance line between Romania and Bulgaria and a straight line connecting the endpoint of the Romanian/Bulgarian land boundary and a potential tripoint with Bulgaria and/or Turkey. Finally, according to Ukraine, a large triangle lying between Ukraine and Turkey has already been subject to a prior delimitation between the former Soviet Union and Turkey to which Ukraine has succeeded and therefore does not form part of the relevant area (see sketch-map No. 3). 110. The Court observes that the legal concept of the �relevant area� has to be taken into account as part of the methodology of maritime delimitation. In the first place, depending on the configuration of the relevant coasts in the general geographical context and the methods for the construction of their seaward projections, the relevant area may include certain maritime spaces and exclude others which are not germane to the case in hand. Secondly, the relevant area is pertinent to checking disproportionality. This will be done as the final phase of the methodology. The purpose of delimitation is not to apportion equal shares of the area, nor indeed proportional shares. The test of disproportionality is not in itself a method of delimitation. It is rather a means of checking whether the delimitation line arrived at by other means needs adjustment because of a significant disproportionality in the ratios between the maritime areas which would fall to one party or other by virtue of the delimitation line arrived at by other means, and the lengths of their respective coasts. 111. The Court further observes that for the purposes of this final exercise in the delimitation process the calculation of the relevant area does not purport to be precise and is approximate. The object of delimitation is to achieve a delimitation that is equitable, not an equal apportionment of maritime areas (North Sea Continental Shelf (Federal Republic of Germany/Denmark; Federal Republic of Germany/Netherlands), Judgment, I.C.J. Reports 1969 p. 22, para. 18; Maritime Delimitation in the Area between Greenland and Jan Mayen (Denmark v. Norway), Judgment, I.C.J Reports 1993, p. 67, para. 64). 112. 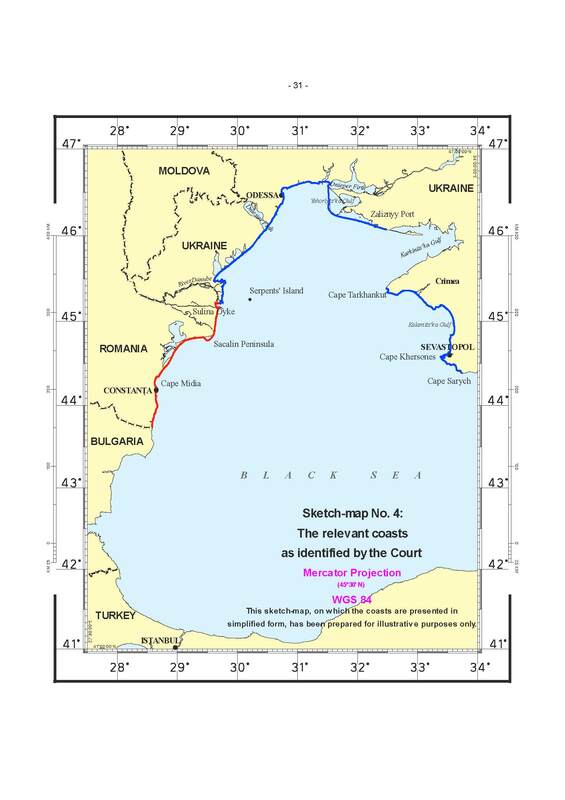 The Court notes that the delimitation will occur within the enclosed Black Sea, with Romania being both adjacent to, and opposite Ukraine, and with Bulgaria and Turkey lying to the south. It will stay north of any area where third party interests could become involved. 113. As for the area in the north disputed by the Parties as a relevant area, as explained above (see paragraph 101) the Court has taken the view that the section of the Ukrainian coast situated to the north of the line running from Point S to Cape Tarkhankut is a relevant coast for the purpose of the delimitation exercise. Accordingly, the area lying immediately south of this coast, but excluding Karkinits�ka Gulf at the mouth of which the Court has drawn a line (see paragraph 100 above), falls within the delimitation area. 114. The Court turns now to the southern limit of the relevant area. The Parties hold different views as to whether the south-western and south-eastern �triangles� should be included in the relevant area (see paragraphs 107 and 109 above and sketch-map Nos. 2 and 3). The Court notes that in both these triangles the maritime entitlements of Romania and Ukraine overlap. The Court is also aware that in the south-western triangle, as well as in the small area in the western corner of the south-eastern triangle, entitlements of third parties may come into play. However where areas are included solely for the purpose of approximate identification of overlapping entitlements of the Parties to the case, which may be deemed to constitute the relevant area (and which in due course will play a part in the final stage testing for disproportionality), third party entitlements cannot be affected. Third party entitlements would only be relevant if the delimitation between Romania and Ukraine were to affect them. In light of these considerations, and without prejudice to the position of any third State regarding its entitlements in this area, the Court finds it appropriate in the circumstances of this case to include both the south-western and the south-eastern triangles in its calculation of the relevant area (see sketch-map No. 5). 115. When called upon to delimit the continental shelf or exclusive economic zones, or to draw a single delimitation line, the Court proceeds in defined stages. 116. These separate stages, broadly explained in the case concerning Continental Shelf (Libyan Arab Jamahiriya/Malta) (Judgment, I.C.J. Reports 1985, p. 46, para. 60), have in recent decades been specified with precision. First, the Court will establish a provisional delimitation line, using methods that are geometrically objective and also appropriate for the geography of the area in which the delimitation is to take place. So far as delimitation between adjacent coasts is concerned, an equidistance line will be drawn unless there are compelling reasons that make this unfeasible in the particular case (see Territorial and Maritime Dispute between Nicaragua and Honduras in the Caribbean Sea (Nicaragua v. Honduras), Judgment of 8 October 2007, para. 281). So far as opposite coasts are concerned, the provisional delimitation line will consist of a median line between the two coasts. No legal consequences flow from the use of the terms �median line� and �equidistance line� since the method of delimitation is the same for both. 117. Equidistance and median lines are to be constructed from the most appropriate points on the coasts of the two States concerned, with particular attention being paid to those protuberant coastal points situated nearest to the area to the delimited. The Court considers elsewhere (see paragraphs 135-137 below) the extent to which the Court may, when constructing a single-purpose delimitation line, deviate from the base points selected by the parties for their territorial seas. When construction of a provisional equidistance line between adjacent States is called for, the Court will have in mind considerations relating to both parties� coastlines when choosing its own base points for this purpose. The line thus adopted is heavily dependent on the physical geography and the most seaward points of the two coasts. 118. In keeping with its settled jurisprudence on maritime delimitation, the first stage of the Court�s approach is to establish the provisional equidistance line. At this initial stage of the construction of the provisional equidistance line the Court is not yet concerned with any relevant circumstances that may obtain and the line is plotted on strictly geometrical criteria on the basis of objective data. 119. In the present case the Court will thus begin by drawing a provisional equidistance line between the adjacent coasts of Romania and Ukraine, which will then continue as a median line between their opposite coasts. 120. The course of the final line should result in an equitable solution (Articles 74 and 83 of UNCLOS). Therefore, the Court will at the next, second stage consider whether there are factors calling for the adjustment or shifting of the provisional equidistance line in order to achieve an equitable result (Land and Maritime Boundary between Cameroon and Nigeria (Cameroon v.
Nigeria: Equatorial Guinea intervening), Judgment, I.C.J. Reports 2002, p. 441, para. 288). The Court has also made clear that when the line to be drawn covers several zones of coincident jurisdictions, �the so-called equitable principles/relevant circumstances method may usefully be applied, as in these maritime zones this method is also suited to achieving an equitable result� (Territorial and Maritime Dispute between Nicaragua and Honduras in the Caribbean Sea (Nicaragua v. Honduras), Judgment of 8 October 2007, para. 271). 121. This is the second part of the delimitation exercise to which the Court will turn, having first established the provisional equidistance line. 122. Finally, and at a third stage, the Court will verify that the line (a provisional equidistance line which may or may not have been adjusted by taking into account the relevant circumstances) does not, as it stands, lead to an inequitable result by reason of any marked disproportion between the ratio of the respective coastal lengths and the ratio between the relevant maritime area of each State by reference to the delimitation line (see paragraphs 214-215). A final check for an equitable outcome entails a confirmation that no great disproportionality of maritime areas is evident by comparison to the ratio of coastal lengths. This is not to suggest that these respective areas should be proportionate to coastal lengths --as the Court has said �the sharing out of the area is therefore the consequence of the delimitation, not vice versa� (Maritime Delimitation in the Area between Greenland and Jan Mayen (Denmark v. Norway), Judgment, I.C.J. Reports 1993, p. 67, para. 64). 123. Romania contends that the base points to take into account in constructing the provisional equidistance line between the adjacent coasts of Romania and Ukraine are, on the Romanian coast, the seaward end of the Sulina dyke, and on the Ukrainian coast, a point on the island of Kubansky and Cape Burnas. In addition, in Romania�s view, the base points on the opposite coasts of Romania and Ukraine are, on the Romanian coast, the seaward end of the Sulina dyke and the outer end of the Sacalin Peninsula, and on the Ukrainian coast, Capes Tarkhankut and Khersones. Romania points out that the Sacalin Peninsula and the most seaward point of the Sulina dyke are among the relevant points notified by Romania to the United Nations under Article 16 of UNCLOS for measuring the breadth of the territorial sea. 124. Romania argues that no account should be taken of Serpents� Island as a base point for the purposes of constructing the provisional equidistance line. It claims that Serpents� Island is a rock incapable of sustaining human habitation or economic life of its own, �therefore having no exclusive economic zone or continental shelf, as provided for in Article 121 (3) of the 1982 UNCLOS�. Romania further points out that when Ukraine notified the United Nations of the co-ordinates of its baselines used for measuring the breadth of its territorial sea, it made no reference at all to Serpents� Island. In addition, it considers that using this island as a base point would result in an inordinate distortion of the coastline. 125. Ukraine contends for its part that the relevant base points for the construction of the provisional equidistance line are situated on the baselines of each of the Parties from which the breadth of their territorial sea is measured. Thus, on the Romanian coast, Ukraine has used the base points situated on the Sulina dyke and the Sacalin Peninsula. On its own coasts, it has taken as a reference �the base points situated on Serpents� Island� and the tip of Cape Khersones. Ukraine indicates, however, that Romania�s use of a point situated at the seaward tip of the Sulina dyke has a huge effect on Romania�s provisional equidistance line. It also considers that �[t]he notion that a protruding, man-made structure can be given a full effect for purposes of plotting the provisional equidistance line, while a natural feature -- an island [Serpents� Island] -- can simply be ignored does not comport with a proper application of the law or with equitable principles�. 126. Ukraine maintains that because Serpents� Island has a coast, it follows that it has a baseline. As a result, it states that there are base points on that baseline that can be used for plotting the provisional equidistance line. It points out that, contrary to what Romania claims, �normal� baselines, defined as the low-water mark around the coast, do not have to be notified to the United Nations, as straight baselines have to be. Ukraine therefore contends that given its proximity to the Ukrainian mainland, Serpents� Island should clearly be taken into account as one of the relevant base points for the construction of the provisional equidistance line. It notes that the belt of territorial sea which surrounds Serpents� Island partly overlaps with the area of territorial sea bordering the Ukrainian mainland. Consequently, �[t]his island therefore represents what is commonly termed a coastal island�. 127. In this stage of the delimitation exercise, the Court will identify the appropriate points on the Parties� relevant coast or coasts which mark a significant change in the direction of the coast, in such a way that the geometrical figure formed by the line connecting all these points reflects the general direction of the coastlines. The points thus selected on each coast will have an effect on the provisional equidistance line that takes due account of the geography. 128. The Court observes that in this instance, the geography shows that the capacity of the coasts to generate overlapping titles indicates the existence of two areas: in one case, the coasts are adjacent; in the other, they are opposite. In practice, the first conclusion which the Court draws from this is that, on the Romanian coast, the significant base points from which the equidistance line and the median line must be established are the same, since this coast is both adjacent and opposite to the Ukrainian coast. The second conclusion is that, as the Ukrainian coast consists of two portions -- one adjacent to the Romanian coast, the other opposite to it -- the base points to take into account must be defined separately, according to whether the adjacent or opposite portion is concerned. The third conclusion is the identification of a turning-point on the equidistance line where the effects of adjacency give way to those of the coasts on the opposite side, resulting in a change in the direction of the line. Lastly, the Court will need to consider the relevance or otherwise of Serpents� Island in terms of the choice of base points. geomorphological features of the peninsula and its possibly sandy nature have no bearing on the elements of its physical geography which are relevant for maritime delimitation. For these reasons, the Court considers it appropriate, for the purpose of establishing the provisional equidistance line, to use a base point on the Sacalin Peninsula (44� 50' 28"N and 29� 36' 52"E), which happens to correspond to the point notified by Romania to the United Nations as a base point pursuant to Article 16 of UNCLOS. 130. The Court will next consider whether any point on the Romanian coast of the Musura Bay may serve as a base point. The southern headland of this bay is the most prominent point of the Romanian coast in the direction of the Crimea and is also situated in the area where the coasts of the two States are adjacent. These two characteristics prompt its selection for the purpose of establishing the provisional equidistance line. However, because of the construction on that southern headland of a 7.5 km-long dyke out to sea, which accordingly extends this feature, it is necessary to choose either the seaward end of the dyke or the end where it adjoins the mainland. 131. In this respect, the Court observes that the geometrical nature of the first stage of the delimitation exercise leads it to use as base points those which the geography of the coast identifies as a physical reality at the time of the delimitation. That geographical reality covers not only the physical elements produced by geodynamics and the movements of the sea, but also any other material factors that are present. 133. The permanent nature of the Sulina dyke not having been questioned, the Court will have to consider whether this structure can be described as �harbour works� which form �an integral part of the harbour system�. The term �works� denotes a combination of apparatus, structures and facilities installed for a specific purpose. The expression �harbour works� �which form an integral part of the harbour system� is not defined in the Geneva Convention on the Territorial Sea and Contiguous Zone or in UNCLOS; these are generally installations which allow ships to be harboured, maintained or repaired and which permit or facilitate the embarkation and disembarkation of passengers and the loading or unloading of goods. In the light of the above, the ILC did not, at the time, intend to define precisely the limit beyond which a dyke, jetty or works would no longer form �an integral part of the harbour system�. The Court concludes from this that there are grounds for proceeding on a case-by-case basis, and that the text of Article 11 of UNCLOS and the travaux préparatoires do not preclude the possibility of interpreting restrictively the concept of harbour works so as to avoid or mitigate the problem of excessive length identified by the ILC. This may be particularly true where, as here, the question is one of delimitation of areas seaward of the territorial sea. 135. With regard to the use of the Sulina dyke as a base point for the present delimitation, the Court must consider the relevance of Romania�s notification to the United Nations under Article 16 of UNCLOS, in which Romania used the seaward end of the Sulina dyke as a base point for drawing the baseline for its territorial sea. This choice of base points was not contested by Ukraine. 136. Article 16 provides that �the base lines for measuring the breadth of the territorial sea . . . and the lines of delimitation [of the territorial sea] shall be shown on charts� (paragraph 1) and that �the coastal State shall deposit a copy of each such chart or list with the Secretary-General of the United Nations�. Since Article 57 (regarding the breadth of the exclusive economic zone) and Article 76, paragraph 1, (regarding the definition of the continental shelf) of UNCLOS stipulate that these maritime zones can extend to a distance of 200 nautical miles �from the baselines from which the breadth of the territorial sea is measured�, the question arises as to whether the same seaward end of the Sulina dyke has to be retained for the purpose of the present delimitation. 137. The Court observes that the issue of determining the baseline for the purpose of measuring the breadth of the continental shelf and the exclusive economic zone and the issue of identifying base points for drawing an equidistance/median line for the purpose of delimiting the continental shelf and the exclusive economic zone between adjacent/opposite States are two different issues. In the first case, the coastal State, in conformity with the provisions of UNCLOS (Articles 7, 9, 10, 12 and 15), may determine the relevant base points. It is nevertheless an exercise which has always an international aspect (see Fisheries (United Kingdom v. Norway), Judgment, I.C.J. Reports 1951, p. 132). In the second case, the delimitation of the maritime areas involving two or more States, the Court should not base itself solely on the choice of base points made by one of those parties. The Court must, when delimiting the continental shelf and exclusive economic zones, select base points by reference to the physical geography of the relevant coasts. port activities. For these reasons, the Court is not satisfied that the seaward end of the Sulina dyke is a proper base point for the purposes of the construction of a provisional equidistance line delimiting the continental shelf and the exclusive economic zones. 139. On the other hand, while the landward end of the dyke may not be an integral part of the Romanian mainland, it is a fixed point on it. The land at this point is protected from shifts in the coastline due to marine processes. As a relevant base point for the purposes of the first stage of delimitation, it has the advantage, unlike the seaward end of the dyke, of not giving greater importance to an installation than to the physical geography of the landmass. 140. For these reasons, the Court is of the opinion that the landward end of the Sulina dyke where it joins the Romanian mainland should be used as a base point for the establishment of the provisional equidistance line. 141. 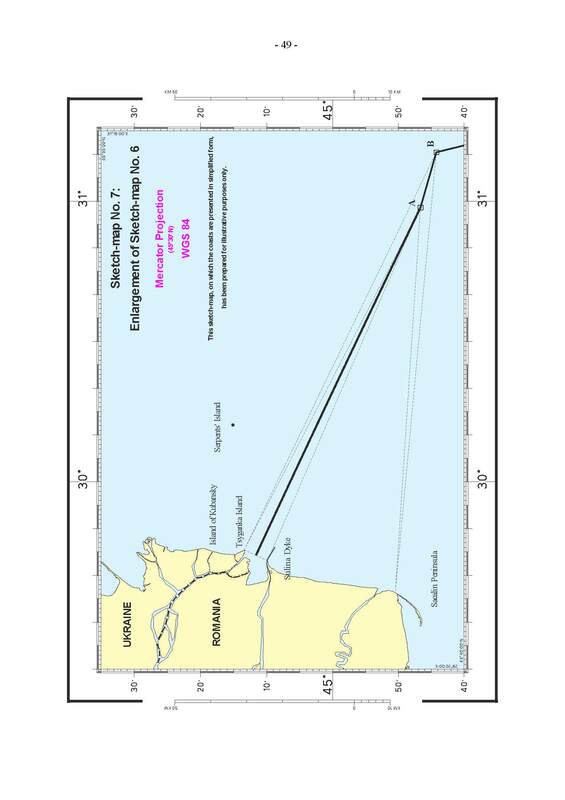 The Court therefore concludes that it will use the Sacalin Peninsula (44� 50' 28"N and 29� 36' 52"E) and the landward end of the Sulina dyke (45� 09' 51.9"N and 29� 43' 14.5"E) [FN2] as base points on the Romanian coast. [FN2] Co-ordinates provided by the Parties in Pulkovo datum. 142. The Court will now turn to identifying the relevant base points on Ukraine�s coast, starting with the sector of adjacent coasts. 143. The Court deems it appropriate in this first sector to use the south-eastern tip of Tsyganka Island on the Ukrainian side, which is the counterpart of the landward end of the Sulina dyke on the Romanian side. Its location is significant, because in this area of adjacency it is the most prominent point on the Ukrainian coast. 144. In this sector of adjacent coasts, the Court needs also to consider the relevance of the Ukrainian base point situated on the island of Kubansky as a base point for use in constructing the provisional equidistance line. The Court notes that this base point does not produce any effect on the equidistance line plotted by reference to the base point on Tsyganka Island on the Ukrainian coast and the base point on the landward end of the Sulina dyke on the Romanian coast. This base point is therefore to be regarded as irrelevant for the purposes of the present delimitation. 145. The Court will now consider the base points on the section of Ukraine�s coast opposite Romania�s coast. 146. It will start with Cape Tarkhankut, the most seaward point facing Romania�s coast on the Crimean coast. The Crimean coastline juts out significantly here, and its configuration makes this cape an appropriate choice as a relevant base point. 147. Cape Khersones, another point on the Crimean coast where the land protrudes into the sea, also juts out markedly, though less so than Cape Tarkhankut. This configuration is sufficient to justify choosing Cape Khersones as a relevant base point. 148. The Court therefore concludes that it will use Tsyganka Island (45� 13' 23.1"N and 29� 45' 33.1"E), Cape Tarkhankut (45� 20' 50"N and 32� 29' 43"E) and Cape Khersones (44� 35' 04"N and 33� 22' 48"E)3 as base points on the Ukrainian coast. 149. Serpents� Island calls for specific attention in the determination of the provisional equidistance line. In connection with the selection of base points, the Court observes that there have been instances when coastal islands have been considered part of a State�s coast, in particular when a coast is made up of a cluster of fringe islands. Thus in one maritime delimitation arbitration, an international tribunal placed base points lying on the low water line of certain fringe islands considered to constitute part of the very coastline of one of the parties (Award of the Arbitral Tribunal in the Second Stage of the Proceedings between Eritrea and Yemen (Maritime Delimitation), 17 December 1999, RIAA, Vol. XXII (2001), pp. 367-368, paras. 139-146). However, Serpents� Island, lying alone and some 20 nautical miles away from the mainland, is not one of a cluster of fringe islands constituting �the coast� of Ukraine. To count Serpents� Island as a relevant part of the coast would amount to grafting an extraneous element onto Ukraine�s coastline; the consequence would be a judicial refashioning of geography, which neither the law nor practice of maritime delimitation authorizes. The Court is thus of the view that Serpents� Island cannot be taken to form part of Ukraine�s coastal configuration (cf. the islet of Filfla in the case concerning Continental Shelf (Libyan Arab Jamahiriya/Malta), Judgment, I.C.J. Reports 1985, p. 13). For this reason, the Court considers it inappropriate to select any base points on Serpents� Island for the construction of a provisional equidistance line between the coasts of Romania and Ukraine. Further aspects relevant to Serpents� Island are dealt with at paragraphs 179 to 188 below. 150. Romania argues that the first segment of the maritime boundary delimiting the maritime areas of the two States situated beyond their territorial seas was established by successive agreements between Romania and the Soviet Union: from the final point of the boundary separating the territorial seas of the two States at 45� 05' 21" N and 30� 02' 27" E, the maritime boundary passes along the 12-nautical-mile arc of the circle around Serpents� Island until it reaches a point situated on that arc at 45� 14' 20" N and 30� 29' 12" E (see Section 4). Romania contends that the maritime boundary beyond that point was never delimited between Romania and the USSR or Ukraine. Romania draws a provisional equidistance line from the final point of the land/river 3Co-ordinates provided by the Parties in Pulkovo datum. boundary between the two States taking into account the salient base points of the adjacent Romanian and Ukrainian coasts. These are: on the Romanian coast, the seaward end of the Sulina dyke; and on the Ukrainian coast, the island of Kubansky and Cape Burnas. As the point lying on the arc around Serpents� Island at 45� 14' 20" N and 30� 29' 12" E, is not situated on the equidistance line, but about 2.5 nautical miles to the north, the delimitation of the maritime boundary beyond this point must, in Romania�s view, start by joining it to the provisional equidistance line. The line thus drawn passes through the point at 45� 11' 59" N and 30� 49' 16" E, situated practically mid-way between the 12-nautical-mile arc around Serpents� Island and the tripoint as between the Romanian and Ukrainian adjacent coasts and the opposite Crimean coast, situated at 45� 09' 45" N and 31� 08' 40" E. Romania contends that, from this point southwards, the delimitation is governed by the opposite Romanian and Ukrainian coasts. 151. Romania calculates the median line taking into account the salient base points on the relevant opposite coasts of the two States (the seaward end of the Sulina dyke and the outer end of the Sacalin Peninsula on the Romanian coast, and Capes Tarkhankut and Khersones on the Ukrainian coast). Romania�s equidistance line in the sector of opposite coasts thus coincides with the segment of the median line running from, in the north, the tripoint as between the Romanian and Ukrainian adjacent coasts and the opposite Crimean coast to, in the south, the point beyond which the interests of third States may be affected, which Romania situates at 43� 26' 50" N and 31� 20' 10" E.
152. Ukraine maintains that the provisional equidistance line must be constructed by reference to the base points on each Party�s baselines from which the breadth of its territorial sea is measured. Thus, on the Romanian side, Ukraine uses the base points at the seaward end of the Sulina dyke and on the Sacalin Peninsula. On its own side, it uses the base points on Serpents� Island and at the tip of Cape Khersones. The provisional equidistance line advocated by Ukraine starts at the point of intersection of the territorial seas of the Parties identified in Article 1 of the 2003 State Border Régime Treaty (45� 05' 21" N and 30� 02' 27" E). The line then runs in a southerly direction until the point at 44� 48' 24" N and 30� 10' 56" E, after which it turns to run in a south-easterly direction until the point at 43� 55' 33" N and 31� 23' 26" E and thereafter continues due south. 153. The Court recalls that the base points which must be used in constructing the provisional equidistance line are those situated on the Sacalin Peninsula and the landward end of the Sulina dyke on the Romanian coast, and Tsyganka Island, Cape Tarkhankut and Cape Khersones on the Ukrainian coast. 154. In its initial segment the provisional equidistance line between the Romanian and Ukrainian adjacent coasts is controlled by base points located on the landward end of the Sulina dyke on the Romanian coast and south-eastern tip of Tsyganka Island on the Ukrainian coast. It runs in a south-easterly direction, from a point lying midway between these two base points, until Point A (with co-ordinates 44� 46' 38.7" N and 30� 58' 37.3" E) where it becomes affected by a base point located on the Sacalin Peninsula on the Romanian coast. At Point A the equidistance line slightly changes direction and continues to Point B (with co-ordinates 44� 44' 13.4" N and 31� 10' 27.7" E) where it becomes affected by the base point located on Cape Tarkhankut on Ukraine�s opposite coasts. At Point B the equidistance line turns south-south-east and continues to Point C (with co-ordinates 44� 02' 53.0" N and 31� 24' 35.0" E), calculated with reference to base points on the Sacalin Peninsula on the Romanian coast and Capes Tarkhankut and Khersones on the Ukrainian coast. From Point C the equidistance line, starting at an azimuth of 185� 23' 54.5" [FN4], runs in a southerly direction. This line remains governed by the base points on the Sacalin Peninsula on the Romanian coast and Cape Khersones on the Ukrainian coast. [FN4] The geographical co-ordinates used by the Parties for the drawing of the equidistance lines proposed by them are given by reference to Pulkovo datum. The Court, for its part, has chosen to use WGS 84 datum. The positions ofPoints A, B and C are given by reference to that geodetic datum. The equidistance line described in this paragraph is ageodetic line and the azimuth given is a geodetic azimuth based on WGS 84 datum. 155. As the Court indicated above (paragraphs 120-121), once the provisional equidistance line has been drawn, it shall �then [consider] whether there are factors calling for the adjustment or shifting of that line in order to achieve an �equitable result�� (Land and Maritime Boundary between Cameroon and Nigeria (Cameroon v. Nigeria: Equatorial Guinea intervening), Judgment, I.C.J. Reports 2002, p. 441, para. 288). Such factors have usually been referred to in the jurisprudence of the Court, since the North Sea Continental Shelf (Federal Republic of Germany/Denmark; Federal Republic of Germany/Netherlands) cases, as the relevant circumstances (Judgment, I.C.J. Reports 1969, p. 53, para. 53). Their function is to verify that the provisional equidistance line, drawn by the geometrical method from the determined base points on the coasts of the Parties is not, in light of the particular circumstances of the case, perceived as inequitable. If such would be the case, the Court should adjust the line in order to achieve the �equitable solution� as required by Articles 74, paragraph 1, and 83, paragraph 1, of UNCLOS. 156. The Parties suggested and discussed several factors which they consider as the possible relevant circumstances of the case. They arrive at different conclusions. Romania argues that its provisional equidistance line achieves the equitable result and thus does not require any adjustment. Ukraine, on the other hand, submits that there are relevant circumstances which call for the adjustment of its provisional equidistance line �by moving the provisional line closer to the Romanian coast�. drawn by the Court, and not by Romania or Ukraine, which will be in the focus of the Court�s attention when analysing what the Parties consider to be the relevant circumstances of the case. 158. The circumstance which Ukraine invokes in order to justify its claim that the provisional equidistance line should be adjusted by moving the delimitation line closer to Romania�s coast is the disparity between the length of the Parties� coasts abutting on the delimitation area. 159. Romania acknowledges that the general configuration of the coasts may constitute, given the particular geographical context, a relevant circumstance that can be taken into consideration with a view to adjusting the equidistance line. However, with regard specifically to any disproportion between the lengths of the Parties� coasts, Romania notes that in a maritime delimitation it is rare for the disparities between the parties� coasts to feature as a relevant circumstance. Moreover, in the present case, there is no manifest disparity in the respective coastal lengths of Romania and Ukraine. 160. Romania adds that in any event proportionality should be dealt with �only after having identified the line resulting from the application of the equitable principles/special circumstances approach�. 161. In conclusion Romania is of the view that the alleged �geographical predominance of Ukraine in the area� and �the disparity between coastal lengths� of the Parties should not be considered relevant circumstances in the case. 162. With regard to the role which may be played by the coastal configuration, Ukraine states that there is a broad margin of appreciation as to its scope as a relevant circumstance. In the circumstances of the current case, Ukraine argues that the coastal configuration clearly shows the geographical predominance of Ukraine in the relevant area which also finds an expression in terms of coastal length: the Ukrainian relevant coast is more than four times longer than the coast of Romania. Ukraine notes that in almost all maritime delimitation cases dealt with by international tribunals, �comparison of the lengths of the relevant coasts has occupied a quite significant place and even played a decisive role in a number of the decisions taken�. Thus, according to Ukraine, the marked disproportion between lengths of the Parties� coasts is a relevant circumstance to be taken into account in the construction of a delimitation line and should result in a shifting of the provisional equidistance line in order to produce an equitable result. 163. The Court observes that the respective length of coasts can play no role in identifying the equidistance line which has been provisionally established. Delimitation is a function which is different from the apportionment of resources or areas (see North Sea Continental Shelf (Federal Republic of Germany/Denmark; Federal Republic of Germany/Netherlands), Judgment, I.C.J. Reports 1969, p. 22, para. 18). There is no principle of proportionality as such which bears on the initial establishment of the provisional equidistance line. 164. Where disparities in the lengths of coasts are particularly marked, the Court may choose to treat that fact of geography as a relevant circumstance that would require some adjustments to the provisional equidistance line to be made. 165. In the case concerning Land and Maritime Boundary between Cameroon and Nigeria, the Court acknowledged �that a substantial difference in the lengths of the parties� respective coastlines may be a factor to be taken into consideration in order to adjust or shift the provisional delimitation line� (Judgment, I.C.J. Report 2002, p. 446, para. 301; emphasis added), although it found that in the circumstances there was no reason to shift the equidistance line. In the latter case, the Court was of the view that the difference in the lengths of the relevant coasts of Malta and Libya (being in ratio 1:8) �is so great as to justify the adjustment of the median line� (ibid., p. 50, para. 68; emphasis added). The Court added that �the degree of such adjustment does not depend upon a mathematical operation and remains to be examined� (ibid.). 168. In the present case, however the Court sees no such particularly marked disparities between the relevant coasts of Ukraine and Romania that would require it to adjust the provisional equidistance line at this juncture. Although there is doubtless a difference in the length of the relevant coasts of the Parties, the Court recalls that it previously (see paragraph 100 above) excluded the coast of Karkinits�ka Gulf (measuring some 278 km) from further consideration. The Court further notes that it cannot disregard the fact that a good portion of the Ukrainian coast which it considers as relevant projects into the same area as other segments of the Ukrainian coast, thus strengthening but not spatially expanding the Ukrainian entitlement. 169. Romania notes that the enclosed nature of the Black Sea is also a relevant circumstance as part of the wider requirement to take account of the geographical context of the area to be delimited. According to Romania, in considering the equitable nature of an equidistance line, the �general maritime geography� of the Black Sea must be assessed. In Romania�s view, this geographical factor is to be considered together with any pre-existing delimitation agreements so that any new delimitation should not dramatically depart from the method previously used in the same sea between other riparian States in order not to produce an inequitable result. 170. 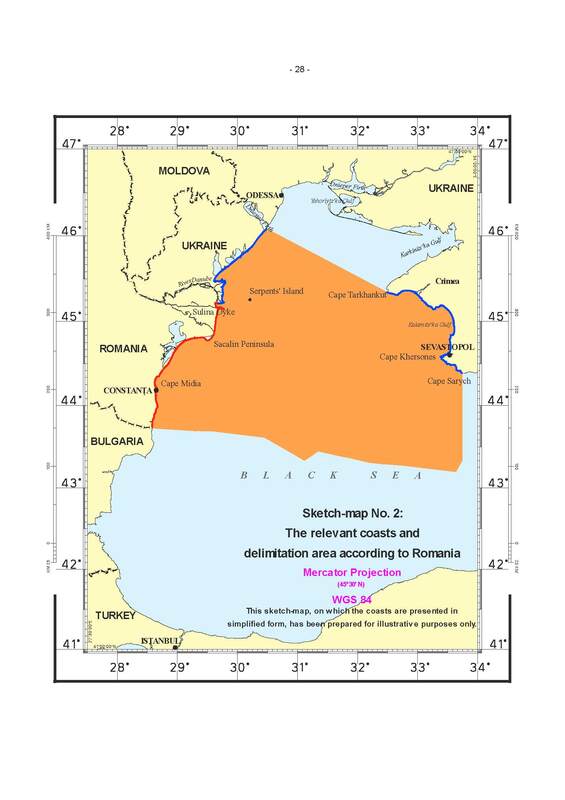 Romania contends that all the delimitation agreements concluded in the Black Sea used equidistance as the method for the delimitation of the continental shelf and the exclusive economic zones. Romania adds that the lines of delimitation established by two of these agreements end with provisionally defined segments, the definitive course of which is to depend on subsequent discussions, and that the reason for this was that the Parties wished to avoid prejudicing the interests of third parties and that they had Romania in mind. 171. Romania concludes that the Black Sea�s nature as an enclosed sea and its rather small size, together with the agreed solutions established in the delimitation agreements in force, constitute a relevant circumstance which must be taken into account in the delimitation process for Romania�s and Ukraine�s maritime areas. 173. Ukraine further notes that in general terms, bilateral agreements cannot affect the rights of third parties and, as such, the existing maritime delimitation agreements in the Black Sea cannot influence the present dispute. 174. The Court recalls that it has intimated earlier, when it briefly described the delimitation methodology, that it would establish a provisional equidistance line (see paragraph 116 above). This choice was not dictated by the fact that in all the delimitation agreements concerning the Black Sea this method was used. 175. Two delimitation agreements concerning the Black Sea were brought to the attention of the Court. The first agreement, the Agreement concerning the Delimitation of the Continental Shelf in the Black Sea, was concluded between Turkey and the USSR on 23 June 1978. Some eight years later, they agreed, through an Exchange of Notes dated 23 December 1986 and 6 February 1987, that the continental shelf boundary agreed in their 1978 Agreement would also constitute the boundary between their exclusive economic zones. The westernmost segment of the line, between two points with co-ordinates 43� 20' 43" N and 32� 00' 00" E and co-ordinates 43� 26' 59" N and 31� 20' 48" E, respectively, remained undefined and to be settled subsequently at a convenient time. After the dissolution of the USSR at the end of 1991, the 1978 Agreement and the Agreement reached through the Exchange of Notes remained in force not only for the Russian Federation, as the State continuing the international legal personality of the former USSR, but also the successor States of the USSR bordering the Black Sea, Ukraine being one of them. 176. The second agreement is the Agreement between Turkey and Bulgaria on the determination of the boundary in the mouth area of the Rezovska/Mutludere River and delimitation of the maritime areas between the two States in the Black Sea, signed on 4 December 1997. The drawing of the delimitation line of the continental shelf and the exclusive economic zone further to the north-east direction, between geographical point 43� 19' 54" N and 31� 06' 33" E and geographical point 43� 26' 49" N and 31� 20' 43" E, was left open for subsequent negotiations at a suitable time. 177. The Court will bear in mind the agreed maritime delimitations between Turkey and Bulgaria, as well as between Turkey and Ukraine, when considering the endpoint of the single maritime boundary it is asked to draw in the present case (see Section 10 below). 178. The Court nevertheless considers that, in the light of the above-mentioned delimitation agreements and the enclosed nature of the Black Sea, no adjustment to the equidistance line as provisionally drawn is called for. 179. The Parties disagree as to the proper characterization of Serpents� Island and the role this maritime feature should play in the delimitation of the continental shelf and the Parties� exclusive economic zones in the Black Sea. 180. Romania maintains that Serpents� Island is entitled to no more than a 12-nautical-mile territorial sea, and that it cannot be used as a base point in drawing a delimitation line beyond the 12-mile limit. Romania claims that Serpents� Island is a rock incapable of sustaining human habitation or economic life of its own, and therefore has no exclusive economic zone or continental shelf, as provided for in Article 121, paragraph 3, of the 1982 UNCLOS. According to Romania, Serpents� Island qualifies as a �rock� because: it is a rocky formation in the geomorphologic sense; it is devoid of natural water sources and virtually devoid of soil, vegetation and fauna. Romania claims that human survival on the island is dependent on supplies, especially of water, from elsewhere and that the natural conditions there do not support the development of economic activities. It adds that �[t]he presence of some individuals, . . . because they have to perform an official duty such as maintaining a lighthouse, does not amount to sustained �human habitation��. 181. Romania further argues that Serpents� Island does not form part of the coastal configuration of the Parties and that its coast cannot therefore be included among Ukraine�s relevant coasts for purposes of the delimitation. 182. Romania nevertheless admits that in the present case the presence of Serpents� Island �with its already agreed belt of 12-nautical-mile territorial sea� might be a relevant circumstance. It asserts that under international jurisprudence and State practice, small islands, irrespective of their legal characterization, have frequently been given very reduced or no effect in the delimitation of the continental shelf, exclusive economic zone or other maritime zones due to the inequitable effect they would produce. Thus, contends Romania, in the present case the provisional equidistance line should be drawn between the relevant mainland coasts of the Parties, with minor maritime formations only being considered at a later stage as possible relevant circumstances. Romania states that Serpents� Island, given its location, could be considered as a relevant circumstance only in the sector of the delimitation area where the coasts are adjacent (in other words, the provisional equidistance line would have to be shifted so as to take into consideration the maritime boundary along the 12-nautical-mile arc around Serpents� Island, which �cannot generate maritime zones beyond 12 nautical miles�). Owing to its remoteness from the Ukrainian coast of Crimea, Serpents� Island cannot, according to Romania, play any role in the delimitation in the area where the coasts are opposite. In short, Romania considers that, although Serpents� Island may qualify as a �special circumstance�, it should not be given any effect beyond 12 nautical miles. 183. Ukraine argues that Serpents� Island has a baseline which generates base points for the construction of the provisional equidistance line. Thus, in Ukraine�s view, the coast of the island constitutes part of Ukraine�s relevant coasts for purposes of the delimitation and cannot be reduced to just a relevant circumstance to be considered only at the second stage of the delimitation process after the provisional equidistance line has been established. 184. According to Ukraine, Serpents� Island is indisputably an �island� under Article 121, paragraph 2, of UNCLOS, rather than a �rock�. Ukraine contends that the evidence shows that Serpents� Island can readily sustain human habitation and that it is well established that it can sustain an economic life of its own. In particular, the island has vegetation and a sufficient supply of fresh water. Ukraine further asserts that Serpents� Island �is an island with appropriate buildings and accommodation for an active population�. Ukraine also argues that paragraph 3 of Article 121 is not relevant to this delimitation because that paragraph is not concerned with questions of delimitation but is, rather, an entitlement provision that has no practical application with respect to a maritime area that is, in any event, within the 200-mile limit of the exclusive economic zone and continental shelf of a mainland coast. 185. In determining the maritime boundary line, in default of any delimitation agreement within the meaning of UNCLOS Articles 74 and 83, the Court may, should relevant circumstances so suggest, adjust the provisional equidistance line to ensure an equitable result. In this phase the Court may be called upon to decide whether this line should be adjusted because of the presence of small islands in its vicinity. As the jurisprudence has indicated, the Court may on occasion decide not to take account of very small islands or decide not to give them their full potential entitlement to maritime zones, should such an approach have a disproportionate effect on the delimitation line under consideration (see Continental Shelf (Libyan Arab Jamahiriya/Malta), Judgment, I.C.J.Reports 1985, p. 48, para. 64; Maritime Delimitation and Territorial Questions between Qatar and Bahrain (Qatar v. Bahrain), Merits, Judgment, I.C.J. Reports 2001, p. 104, para. 219; Territorial and Maritime Dispute between Nicaragua and Honduras in the Caribbean Sea (Nicaragua v. Honduras), Judgment of 8 October 2007, paras. 302 et seq.). 187. With respect to the geography of the north-western part of the Black Sea, the Court has taken due regard of the fact that Ukraine�s coast lies on the west, north and east of this area. The Court notes that all of the areas subject to delimitation in this case are located in the exclusive economic zone and the continental shelf generated by the mainland coasts of the Parties and are moreover within 200 nautical miles of Ukraine�s mainland coast. The Court observes that Serpents� Island is situated approximately 20 nautical miles to the east of Ukraine�s mainland coast in the area of the Danube delta (see paragraph 16 above). Given this geographical configuration and in the context of the delimitation with Romania, any continental shelf and exclusive economic zone entitlements possibly generated by Serpents� Island could not project further than the entitlements generated by Ukraine�s mainland coast because of the southern limit of the delimitation area as identified by the Court (see paragraph 114 and sketch-map No. 5). Further, any possible entitlements generated by Serpents� Island in an eastward direction are fully subsumed by the entitlements generated by the western and eastern mainland coasts of Ukraine itself. The Court also notes that Ukraine itself, even though it considered Serpents� Island to fall under Article 121, paragraph 2, of UNCLOS, did not extend the relevant area beyond the limit generated by its mainland coast, as a consequence of the presence of Serpents� Island in the area of delimitation (see sketch-map No. 3). In the light of these factors, the Court concludes that the presence of Serpents� Island does not call for an adjustment of the provisional equidistance line. In view of the above the Court does not need to consider whether Serpents� Island falls under paragraphs 2 or 3 of Article 121 of UNCLOS nor their relevance to this case. 188. The Court further recalls that a 12-nautical-mile territorial sea was attributed to Serpents� Island pursuant to agreements between the Parties. It concludes that, in the context of the present case, Serpents� Island should have no effect on the delimitation in this case, other than that stemming from the role of the 12-nautical-mile arc of its territorial sea. 189. Ukraine suggests that State activities in the relevant area �constitute a relevant circumstance which operates in favour of the continental shelf/EEZ claim line proposed by Ukraine�. Ukraine explains that it does not point to this conduct of the Parties in order to show the existence of a line arising from a tacit agreement or a modus vivendi. Instead, Ukraine seeks to assess the claims of the Parties in relation to their actual conduct. According to Ukraine, it is significant that Romania�s activities, or lack of them, are �fundamentally inconsistent� with Romania�s argument that there was a pre-existing maritime delimitation in the disputed area extending out to �Point X�. Furthermore, Ukraine contends that the lack of any comparable operations by Romania in the disputed area is incompatible with the position taken by Romania in the proceedings before the Court. 190. Ukraine argues that in 1993, 2001 and 2003 it licensed activities relating to the exploration of oil and gas deposits within the continental shelf/exclusive economic zone area claimed by Ukraine in the current case. It asserts that the existence of these licences demonstrates that Ukraine, both before and after the 1997 Additional Agreement, authorized activities relating to the exploration of oil and gas deposits in areas of the continental shelf to which Romania lays claim in these proceedings. It adds that prior to 2001, Romania never protested Ukraine�s oil and gas activities in areas now claimed by Romania. Ukraine concludes on this point that its oil-related activities are consistent with its delimitation line and should be taken into account together with the other relevant circumstances, in particular the physical geography, in order to achieve an equitable solution. 191. Ukraine further argues that the exclusive economic zone and continental shelf boundary it claims furthermore corresponds generally to the limit of the Parties exclusive fishing zones �as respected by both Romania and Ukraine in their administration of fishing in the north-west part of the Black Sea�. Ukraine emphasizes that it was Ukraine and not Romania that has been active in policing that part of the area. Ukraine contends that Romania has neither demonstrated any interest in patrolling the area nor has it objected to the fact that the Ukrainian coastguard assumed the sole responsibility of intercepting illegal fishing vessels and, when possible, escorting them out of Ukraine�s exclusive economic zone and taking any other appropriate measures. 192. With regard to the notion of a critical date introduced by Romania, Ukraine states that �even assuming that there was a critical date at all, and that the critical date would have a role to play in maritime delimitation, it is the date of Romania�s Application: 16 September 2004�. 193. Romania does not consider that State activities in the relevant area, namely licenses for the exploration and exploitation of oil and gas and fishing practices, constitute relevant circumstances. As a matter of legal principle, �effectivités� or �State activities� cannot constitute an element to be taken into account for the purposes of maritime delimitation. Romania notes that maritime �effectivités� can only be taken into account if they �reflect a tacit agreement� which might constitute a relevant circumstance for delimitation. In order to come within this �exception� to the general rule, it notes that only State activities prior to the critical date may be relevant and that they must be sufficient to prove that �a tacit agreement or modus vivendi exists�. According to Romania, the �effectivités� presented by Ukraine do not reveal the existence of a �de facto line� or of a �pattern of conduct� proving one way or another an agreement between the Parties, or acquiescence by Romania relating in any way to maritime delimitation. These activities cannot therefore constitute an element �undermining Romania�s argument regarding the 1949 Procès-Verbaux�. Romania concludes that it is evident from all the elements regarding the �State activities� in the disputed area that Ukraine has �failed to demonstrate that these State activities comply, in fact or in law, with the necessary criteria that might transform them into a relevant circumstance able to have an impact on [the] delimitation�. 194. Romania further recalls that under the 1997 Additional Agreement the two Parties clearly recognized in writing the existence of a dispute regarding the maritime delimitation, and set the framework for future negotiations to conclude a delimitation agreement. Romania adds that the Agreement�s provisions regarding the existence of the dispute were a mere confirmation of a factual situation that had already existed for a long time. Thus any oil related practice occurring after the conclusion of the 1997 Additional Agreement is, in its view, irrelevant in the present proceedings as the dispute had already crystallized by that date. 195. Romania concludes that Ukraine�s oil concessions practice offers no support to the latter�s claimed delimitation for the following reasons. First, the area covered by the Ukrainian concessions �does not even roughly correspond to its claim in the present proceedings�. Second, two of the three licences were issued in 2001 and 2003, i.e., after the critical date of 1997. Moreover, Romania consistently objected to Ukrainian hydrocarbon activity. 196. With regard to fishing activities, Romania contests that the practice of the Parties has any bearing on the maritime delimitation in the present case since neither party economically depends on fisheries activities in an area in which pelagic fish stocks are limited; the practice invoked by Ukraine is recent and only covers a small part of the area in dispute; and it has always been challenged by Romania and has never been recognized by third States. With regard to the naval patrols, Romania submits, even if they could be considered a relevant circumstance, quod non, all the naval incidents reported by Ukraine are subsequent to the critical date and as such are in any event irrelevant. 197. The Court recalls that it had earlier concluded that there is no agreement in force between the Parties delimiting the continental shelf and the exclusive economic zones of the Parties (see paragraph 76 above). It further notes that Ukraine is not relying on State activities in order to prove a tacit agreement or modus vivendi between the Parties on the line which would separate their respective exclusive economic zones and continental shelves. It rather refers to State activities in order to undermine the line claimed by Romania. 198. The Court does not see, in the circumstances of the present case, any particular role for the State activities invoked above in this maritime delimitation. As the Arbitral Tribunal in the case between Barbados and Trinidad and Tobago observed, �[r]esource-related criteria have been treated more cautiously by the decisions of international courts and tribunals, which have not generally applied this factor as a relevant circumstance� (Award of 11 April 2006, RIAA, Vol. XXVII, p. 214, para. 241). With respect to fisheries, the Court adds that no evidence has been submitted to it by Ukraine that any delimitation line other than that claimed by it would �likely to entail catastrophic repercussions for the livelihood and economic well-being of the population� (Delimitation of the Maritime Boundary in the Gulf of Maine Area (Canada/United States of America), Judgment, I.C.J. Reports 1984, p. 342, para. 237). Since the Court does not consider that the above-mentioned State activities constitute a relevant circumstance in the present case, the issue of critical date discussed by the Parties does not require a response from the Court. 199. Romania contends that its proposed maritime boundary does not cut off the entitlements to the continental shelf and to an exclusive economic zone of either Romania or Ukraine. The area attributed to each Party does not encroach on the natural prolongation of the other. Romania argues that Ukraine�s delimitation line leads to a cut-off of Romania�s maritime entitlements, in particular in the northern sector of its coast between the Sulina dyke and the Sacalin Peninsula. Romania states that the delimitation line advocated by Ukraine would make it extremely difficult for Romania to gain access to the port of Sulina and the maritime branch of the Danube, which is an important route for the transit of merchandise. In short, according to Romania, Ukraine�s claimed line results in a dramatic curtailment of the maritime areas off the Romanian coast, �as if the projection of every stretch of Ukraine�s coast run unobstructed in every direction while there is no opposing or adjacent Romanian territory�. �not only does Romania�s line encroach upon the extension or projection of Ukraine�s south-east-facing coast -- the coast just above the land boundary -- it also produces a cut-off effect on the projection of Ukraine�s south-facing coast lying beyond Odessa�. Ukraine argues that its line fully respects the principle of non-encroachment. It reflects the geographical fact that �Ukraine�s coast fronting the area to be delimited projects in essentially three directions while Romania�s coast projects basically in a single direction -- south-eastwards�. 201. The Court observes that the delimitation lines proposed by the Parties, in particular their first segments, each significantly curtail the entitlement of the other Party to the continental shelf and the exclusive economic zone. The Romanian line obstructs the entitlement of Ukraine generated by its coast adjacent to that of Romania, the entitlement further strengthened by the northern coast of Ukraine. At the same time, the Ukrainian line restricts the entitlement of Romania generated by its coast, in particular its first sector between the Sulina dyke and the Sacalin Peninsula. to adjust the provisional equidistance line on this ground. 202. Romania asserts that there is no evidence to suggest that the delimitation advanced by it would adversely affect Ukraine�s security interests, including Serpents� Island, which has a belt of maritime space of 12 nautical miles. In Romania�s view, Ukraine�s delimitation line runs unreasonably close to the Romanian coast and thus encroaches on the security interests of Romania. 203. Ukraine claims that its line in no way compromises any Romanian security interests because Ukraine�s delimitation line accords to Romania areas of continental shelf and exclusive economic zone off its coastline. In this regard Ukraine refers to �the predominant interest Ukraine has for security and other matters as a function of its geographical position along this part of the Black Sea on three sides of the coast� and maintains that Ukraine has been the only party to police the area and to prevent illegal fishing and other activities in that area. According to Ukraine, its claim is consistent with this aspect of the conduct of the Parties, whereas Romania�s claim is not. 204. The Court confines itself to two observations. First, the legitimate security considerations of the parties may play a role in determining the final delimitation line (see Continental Shelf (Libyan Arab Jamahiriya/Malta), Judgment, I.C.J. Reports 1985, p. 42, par. 51). Second, in the present case however, the provisional equidistance line it has drawn substantially differs from the lines drawn either by Romania or Ukraine. The provisional equidistance line determined by the Court fully respects the legitimate security interests of either Party. Therefore, there is no need to adjust the line on the basis of this consideration. 205. The Court takes note of the fact that Article 1 of the 2003 State Border Régime Treaty situates the meeting point of the territorial seas of the Parties at 45� 05' 21" N and 30� 02' 27" E.
This suffices for the fixing of the starting-point. Romania and Ukraine have both indicated, in considerable detail, the course that their respective delimitation lines would then follow beyond the point fixed by Article 1 of the 2003 State Border Régime Treaty (see paragraph 13 above and sketch-map No. 1). The Court notes that the Parties� positions differ in this regard. 206. The delimitation line decided by the Court, for which neither the seaward end of the Sulina dyke nor Serpents� Island is taken as a base point, begins at Point 1 and follows the 12-nautical-mile arc around Serpents� Island until it intersects with the line equidistant from Romania�s and Ukraine�s adjacent coasts, as defined above; from there, it follows that line until it becomes affected by base points on the opposite coasts of Romania and Ukraine. From this turning point the delimitation line runs along the line equidistant from Romania�s and Ukraine�s opposite coasts (for the course of the equidistance line see paragraph 154 above). 207. Romania maintains that the endpoint of the delimitation line is situated at co-ordinates 43� 26' 50" N and 31� 20' 10" E (Point Z). It asserts that drawing the delimitation line up to Point Z does not affect any possible entitlements of third countries to maritime areas, as Point Z is �practically the point equidistant to the Romanian, Ukrainian and Turkish coasts, and is farther to the Bulgarian coast�. 208. Ukraine argues that no endpoint of the delimitation should be specified, so as to avoid any encroachment on possible entitlements of third States; the line would therefore end in an arrow. The line advocated by Ukraine continues from the point identified by it as Point 3 along the azimuth 156 until it reaches the point where the interests of third States potentially come into play. 209. The Court considers that the delimitation line follows the equidistance line in a southerly direction until the point beyond which the interests of third States may be affected. �it is disproportion rather than any general principle of proportionality which is the relevant criterion or factor . . . there can never be a question of completely refashioning nature . . . it is rather a question of remedying the disproportionality and inequitable effects produced by particular geographical configurations or features� (Anglo-French Continental Shelf Case, RIAA, Vol. XVIII, p. 58, para. 101). 211. The continental shelf and exclusive economic zone allocations are not to be assigned in proportion to length of respective coastlines. Rather, the Court will check, ex post facto, on the equitableness of the delimitation line it has constructed (Delimitation of the maritime boundary between Guinea and Guinea-Bissau, RIAA, Vol. XIX, paras. 94-95). 212. This checking can only be approximate. Diverse techniques have in the past been used for assessing coastal lengths, with no clear requirements of international law having been shown as to whether the real coastline should be followed, or baselines used, or whether or not coasts relating to internal waters should be excluded. 213. The Court cannot but observe that various tribunals, and the Court itself, have drawn different conclusions over the years as to what disparity in coastal lengths would constitute a significant disproportionality which suggested the delimitation line was inequitable, and still required adjustment. This remains in each case a matter for the Court�s appreciation, which it will exercise by reference to the overall geography of the area. 214. In the present case the Court has measured the coasts according to their general direction. It has not used baselines suggested by the Parties for this measurement. Coastlines alongside waters lying behind gulfs or deep inlets have not been included for this purpose. These measurements are necessarily approximate given that the purpose of this final stage is to make sure there is no significant disproportionality. 215. It suffices for this third stage for the Court to note that the ratio of the respective coastal lengths for Romania and Ukraine, measured as described above, is approximately 1:2.8 and the ratio of the relevant area between Romania and Ukraine is approximately 1:2.1. 216. The Court is not of the view that this suggests that the line as constructed, and checked carefully for any relevant circumstances that might have warranted adjustment, requires any alteration. 218. The line of the maritime boundary established by the Court begins at Point 1, the point of intersection of the outer limit of the territorial sea of Romania with the territorial sea of Ukraine around Serpents� Island as stipulated in Article 1 of the 2003 State Border Régime Treaty (see paragraph 28 above). From Point 1 it follows the arc of the 12-nautical-mile territorial sea of Serpents� Island until the arc intersects at Point 2, with co-ordinates 45� 03' 18.5" N and 30� 09' 24.6" E, with a line equidistant from the adjacent coasts of Romania and Ukraine, plotted by reference to base points located on the landward end of the Sulina dyke and the south-eastern tip of Tsyganka Island. The maritime boundary from Point 2 continues along the equidistance line FN5 in a south-easterly direction until Point 3, with co-ordinates 44� 46' 38.7" N and 30� 58' 37.3" E (Point A of the provisional equidistance line), where the equidistance line becomes affected by a base point located on the Sacalin Peninsula. FN5 For the description of the entire course of the equidistance line, see paragraph 154 above. From Point 3 the maritime boundary follows the equidistance line in a south-easterly direction to Point 4, with co-ordinates 44� 44' 13.4" N and 31� 10' 27.7" E (Point B of the provisional equidistance line), where the equidistance line becomes affected by the base point located on Cape Tarkhankut on Ukraine�s opposite coast and turns south-south-east. From Point 4 the boundary traces the line equidistant from the opposite coasts of Romania and Ukraine until Point 5, with co-ordinates 44� 02' 53.0" N and 31� 24' 35.0" E) (Point C of the provisional equidistance line), which is controlled by base points on the Sacalin Peninsula on the Romanian coast and Capes Tarkhankut and Khersones on the Ukrainian coast, from where it continues along the equidistance line in a southerly direction starting at a geodetic azimuth of 185� 23' 54.5" until the maritime boundary reaches the area where the rights of third States may be affected (see sketch-maps Nos. 8 and 9). The geographical co-ordinates for Points 2, 3, 4 and 5 of the single maritime boundary set out in this paragraph and in the operative clause (paragraph 219) are given by reference to WGS 84 datum. Decides that starting from Point 1, as agreed by the Parties in Article 1 of the 2003 State Border Régime Treaty, the line of the single maritime boundary delimiting the continental shelf and the exclusive economic zones of Romania and Ukraine in the Black Sea shall follow the 12-nautical-mile arc of the territorial sea of Ukraine around Serpents� Island until Point 2 (with co-ordinates 45� 03' 18.5" N and 30� 09' 24.6" E) where the arc intersects with the line equidistant from Romania�s and Ukraine�s adjacent coasts. From Point 2 the boundary line shall follow the equidistance line through Points 3 (with co-ordinates 44� 46' 38.7" N and 30� 58' 37.3" E) and 4 (with co-ordinates 44� 44' 13.4" N and 31� 10' 27.7" E) until it reaches Point 5 (with co-ordinates 44� 02' 53.0" N and 31� 24' 35.0" E). From Point 5 the maritime boundary line shall continue along the line equidistant from the opposite coasts of Romania and Ukraine in a southerly direction starting at a geodetic azimuth of 185� 23' 54.5" until it reaches the area where the rights of third States may be affected. Done in French and in English, the French text being authoritative, at the Peace Palace, The Hague, this third day of February, two thousand and nine, in three copies, one of which will be placed in the archives of the Court and the others transmitted to the Government of Romania and the Government of Ukraine, respectively.